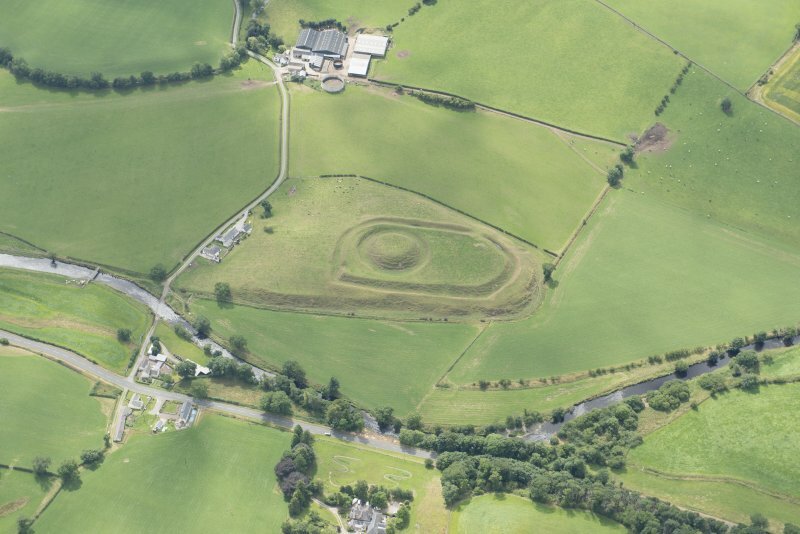 Oblique aerial view centred on the remains of the motte-and-bailey castle, taken from the SW.
Oblique aerial view centred on the remains of the motte-and-bailey castle, taken from the NNW. 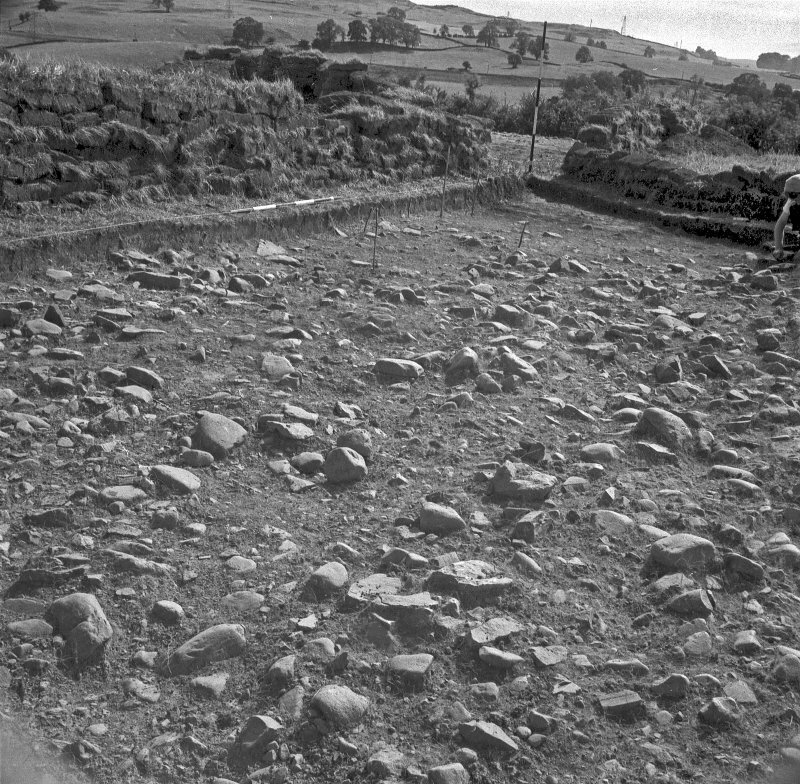 Oblique aerial view of the Mote of Urr, looking SW.
Oblique aerial view centred on the remains of the motte and bailey castle, taken from the SW.
Excavation photographs: view of excavations. 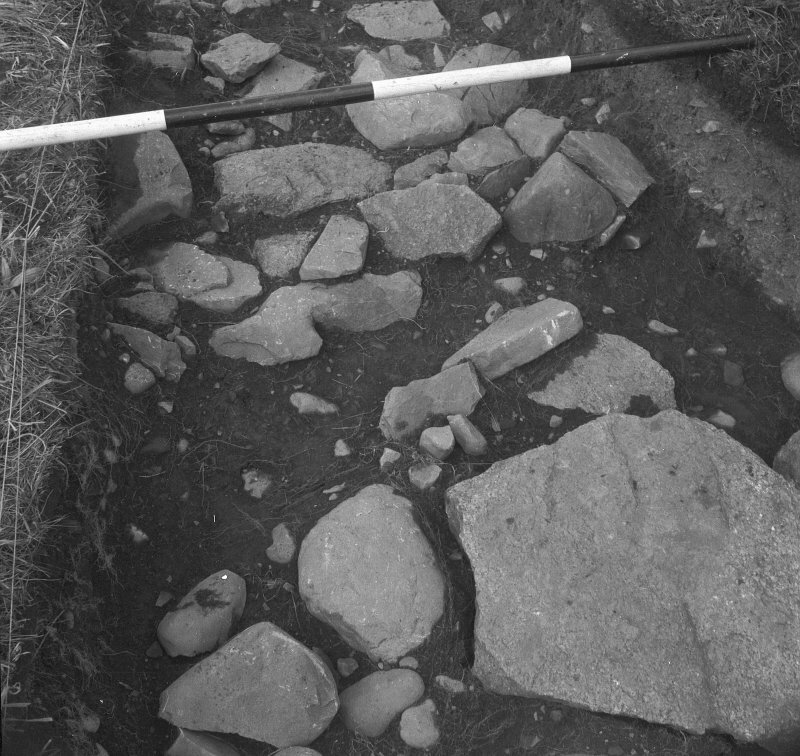 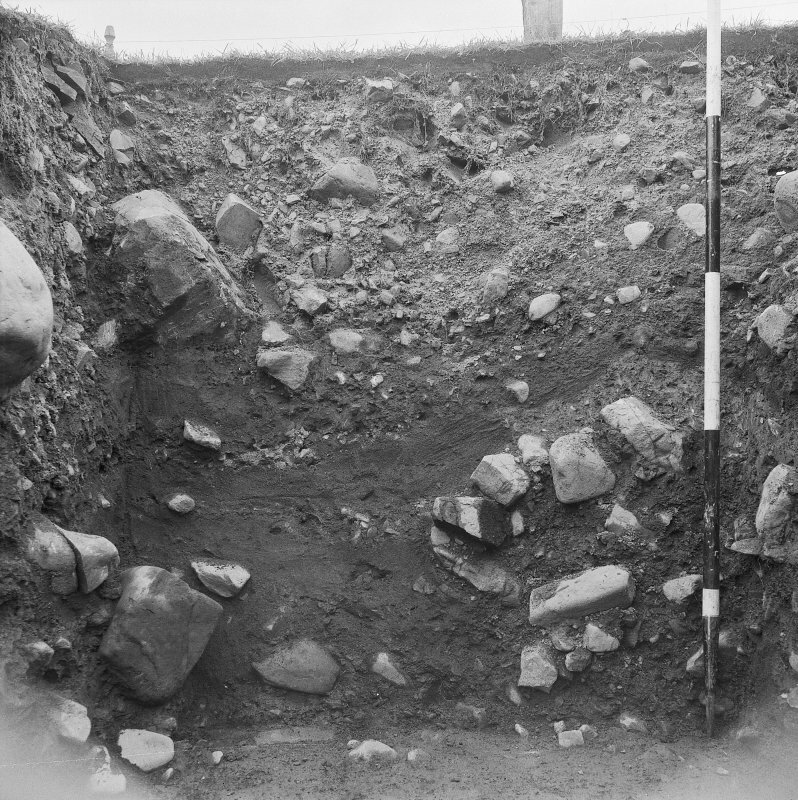 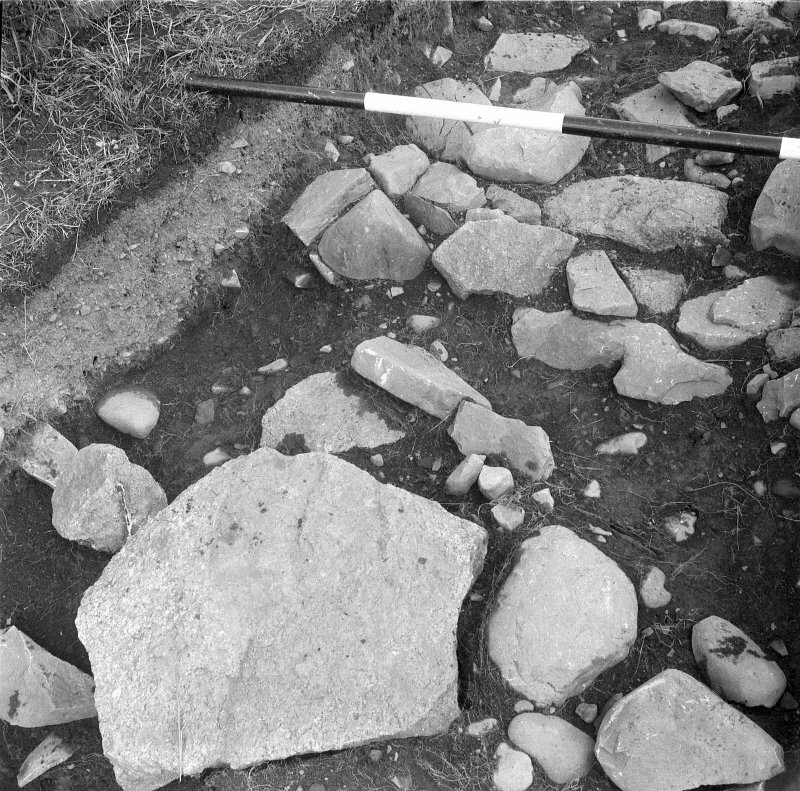 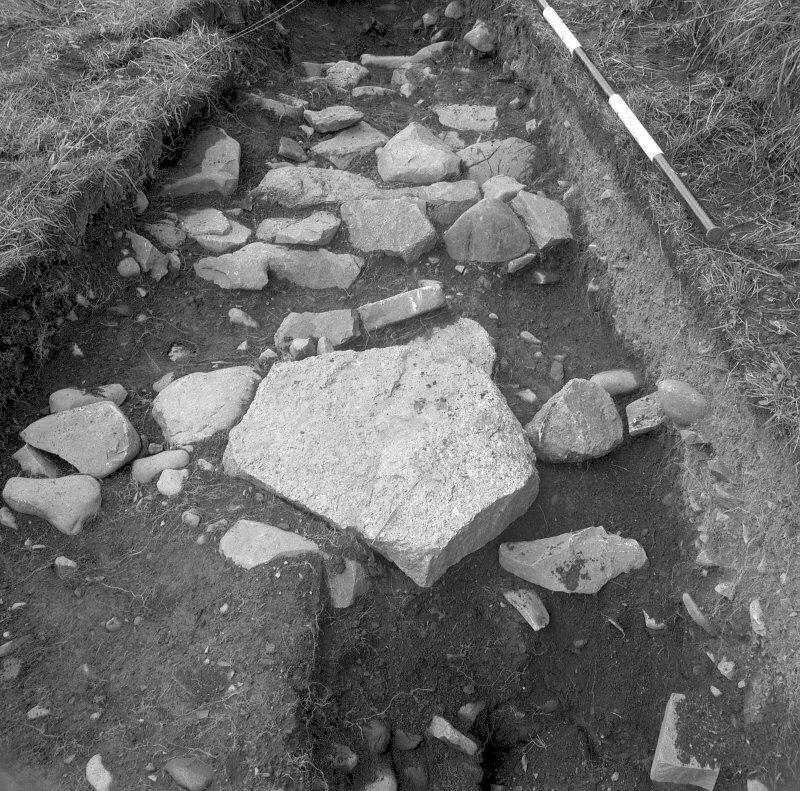 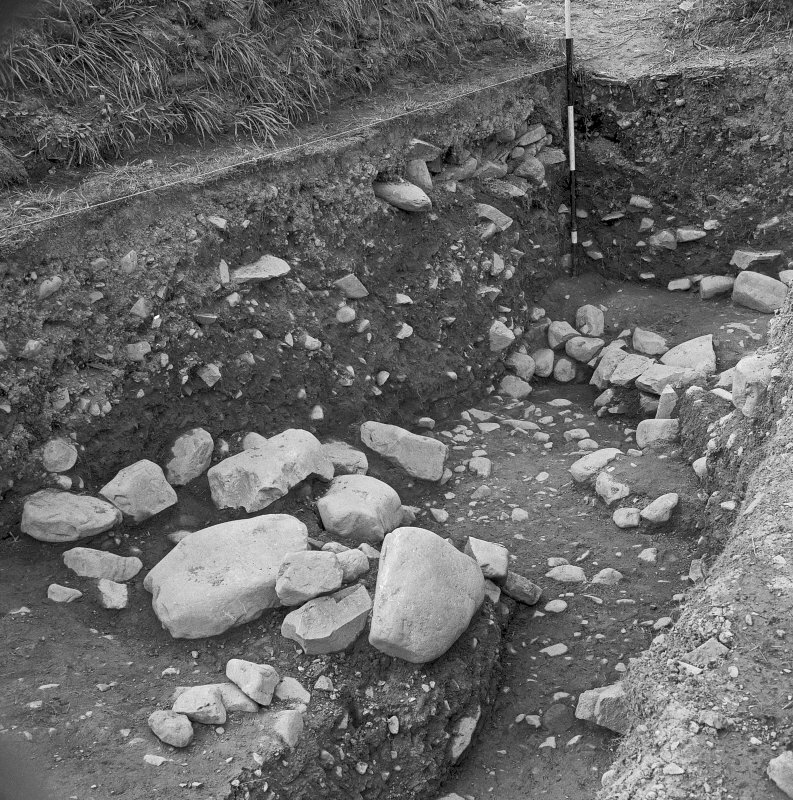 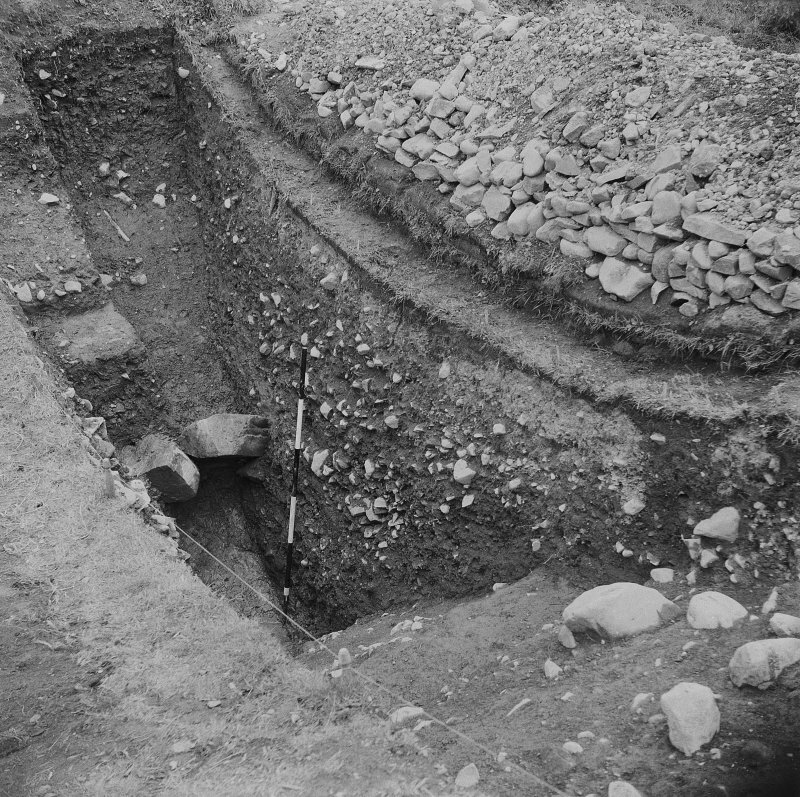 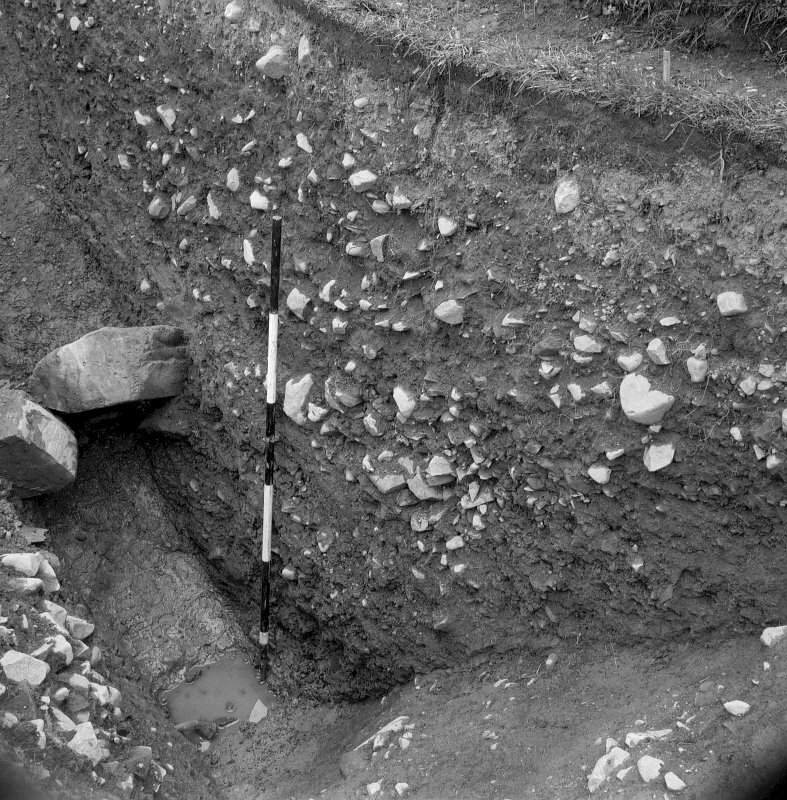 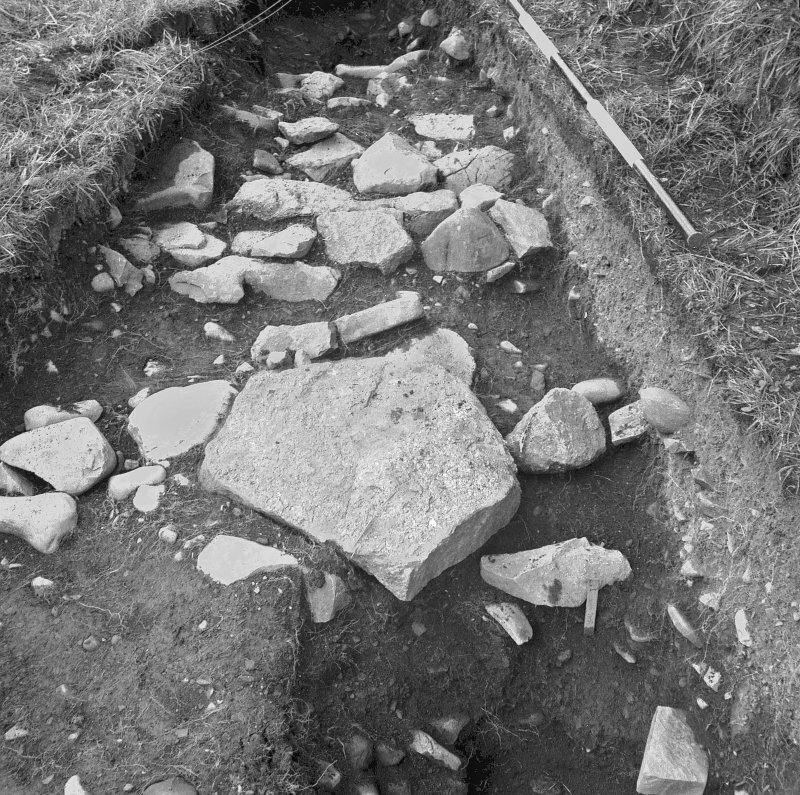 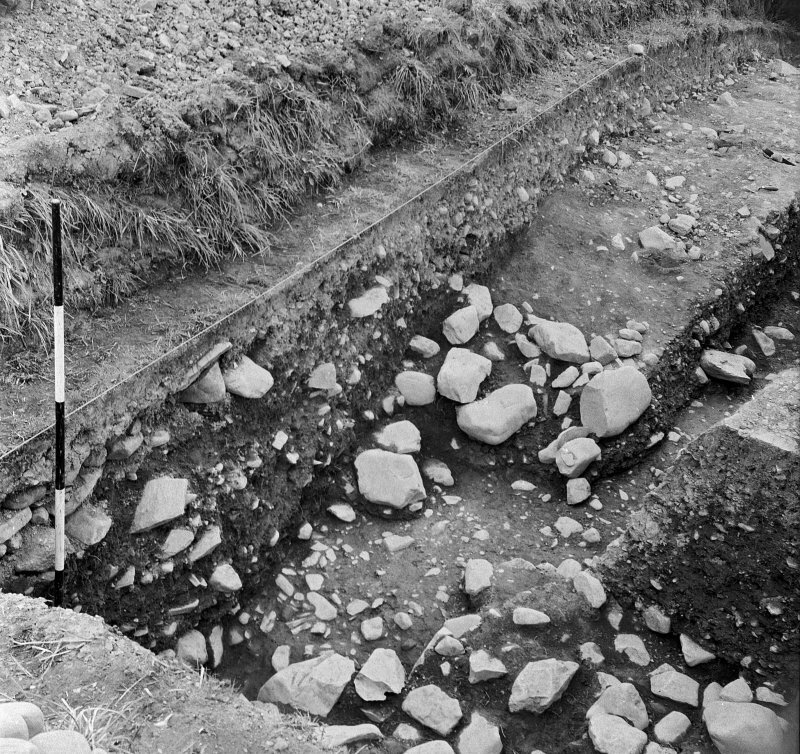 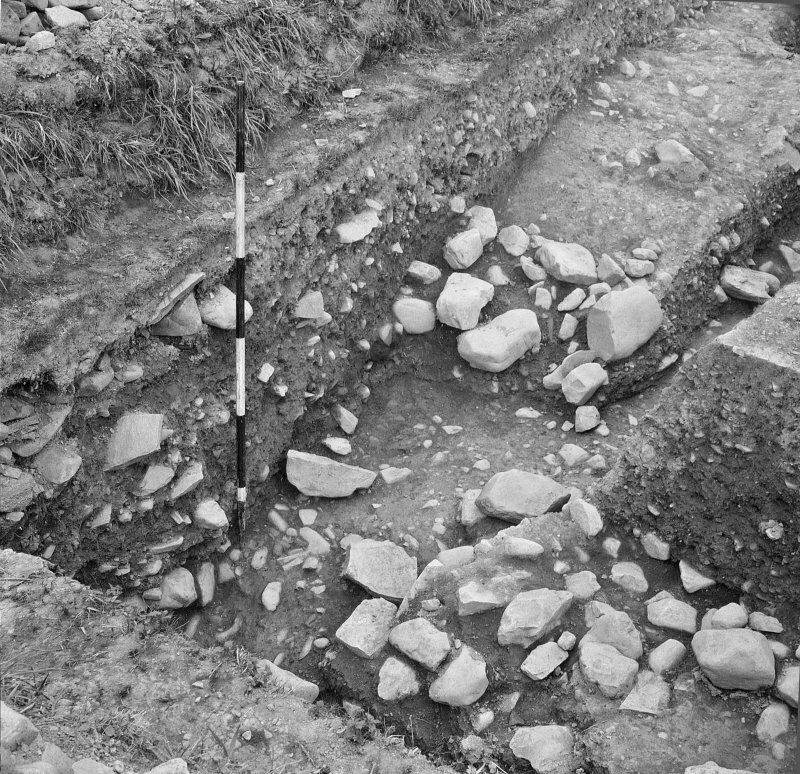 Excavation photographs: view of section through ditch. 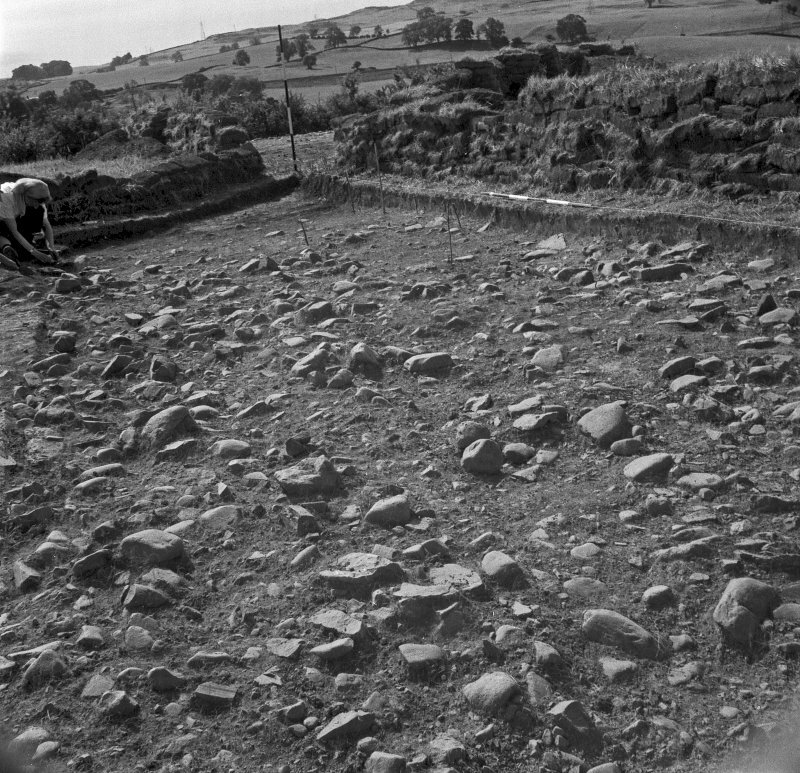 Excavation photographs: Views of excavations and general views. 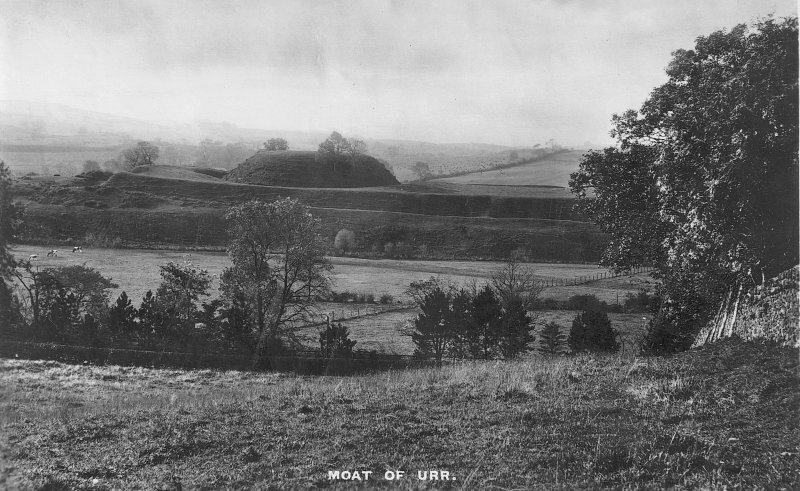 View of Mote of Urr from the distance. 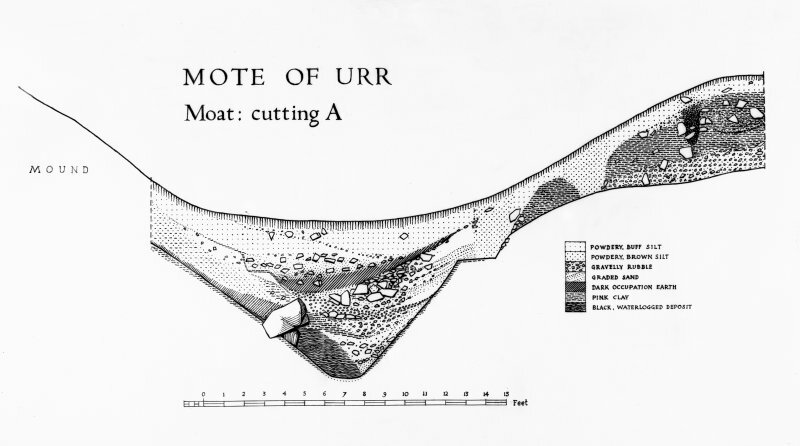 Copy of Mote of Urr section drawing: moat cutting A. 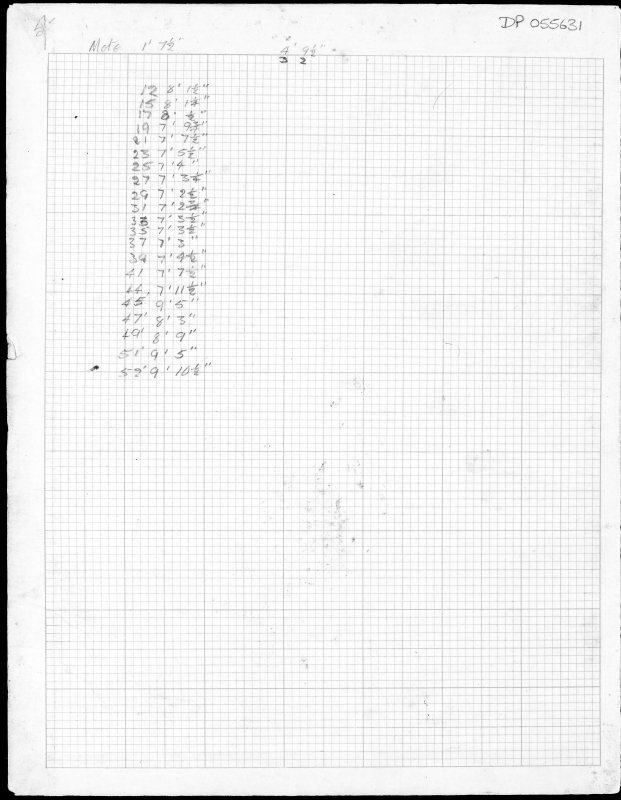 Copy of view of a man (R.J.C. 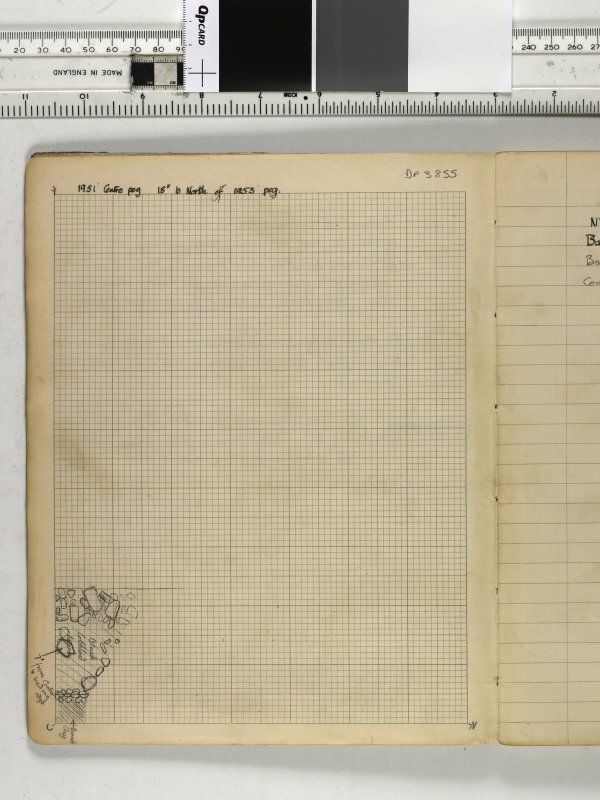 Atkinson?) 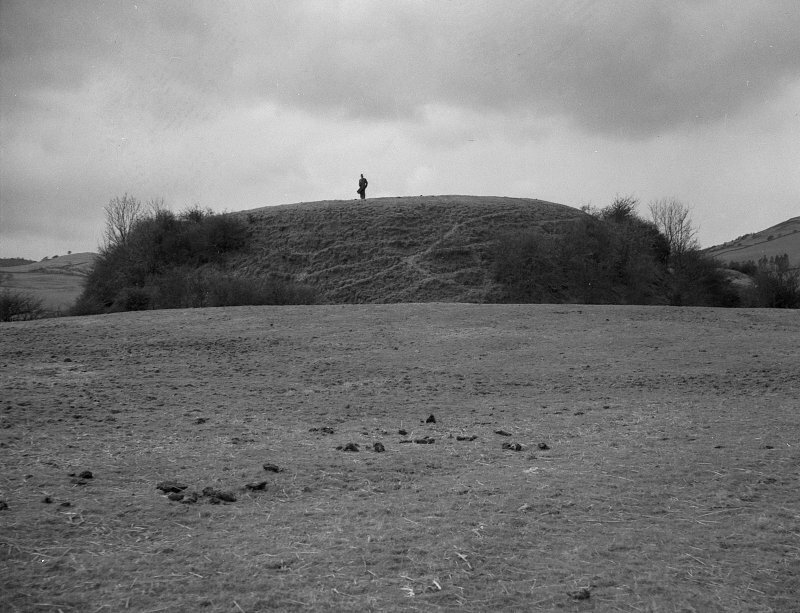 standing in the ditch of the Mote of Urr. 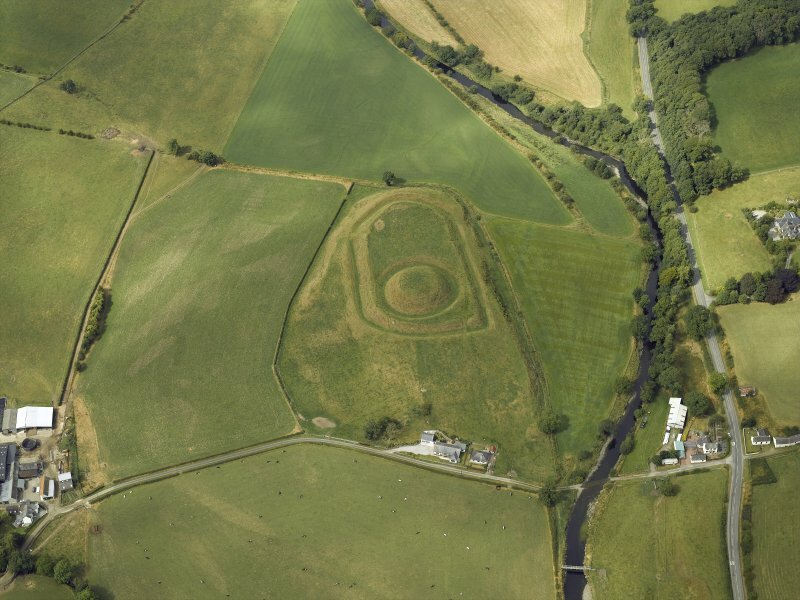 Oblique aerial view centred on the remains of the motte-and-bailey castle, taken from the SSE. 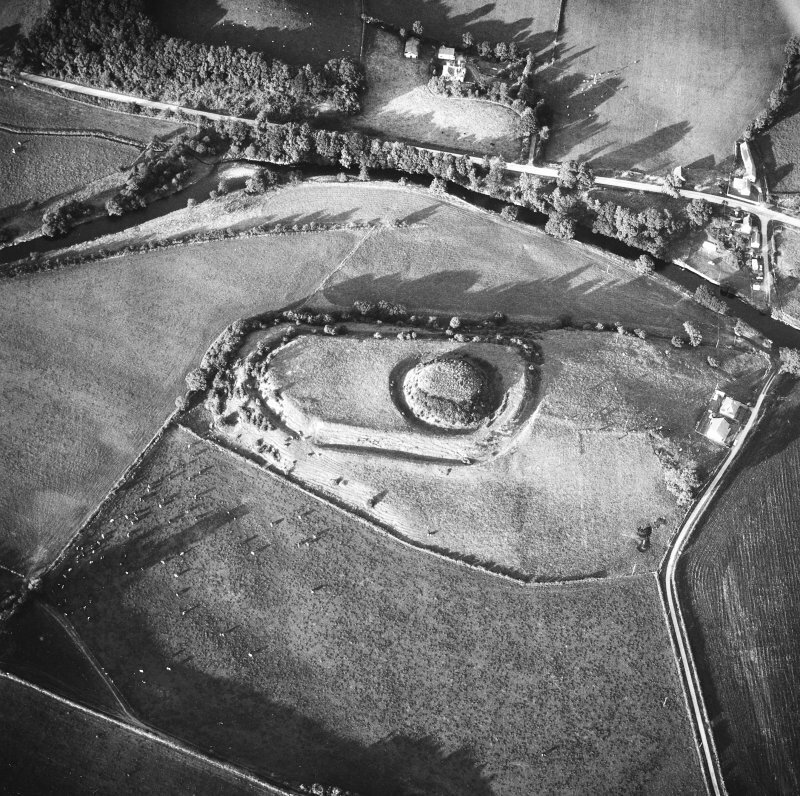 Oblique aerial view centred on the remains of the motte-and-bailey castle, taken from the WNW. 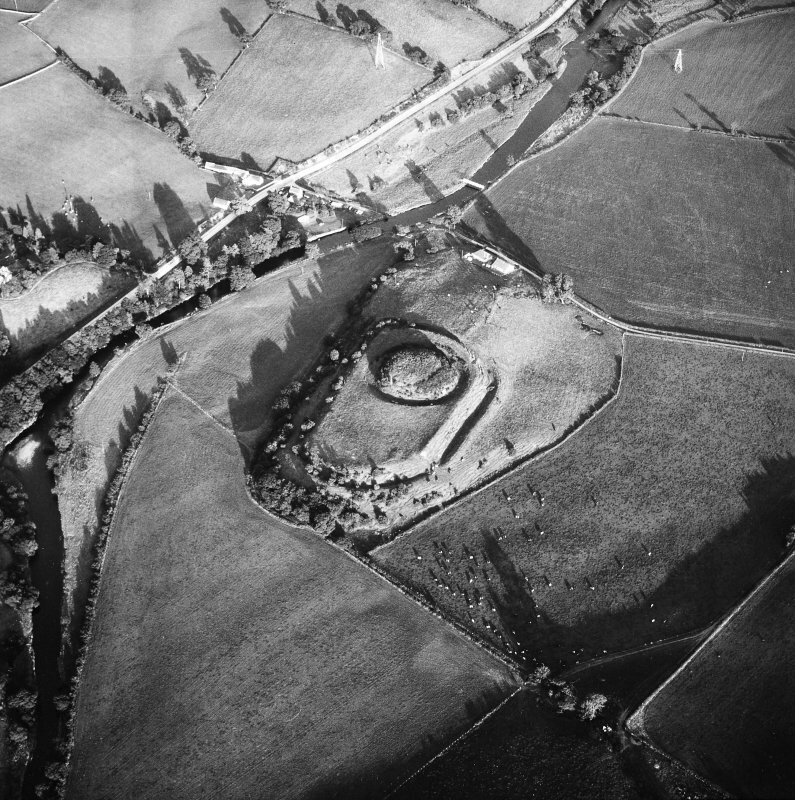 Oblique aerial view of the Mote of Urr, looking W.
Oblique aerial view centred on the remains of the motte and bailey castle, taken from the SE. 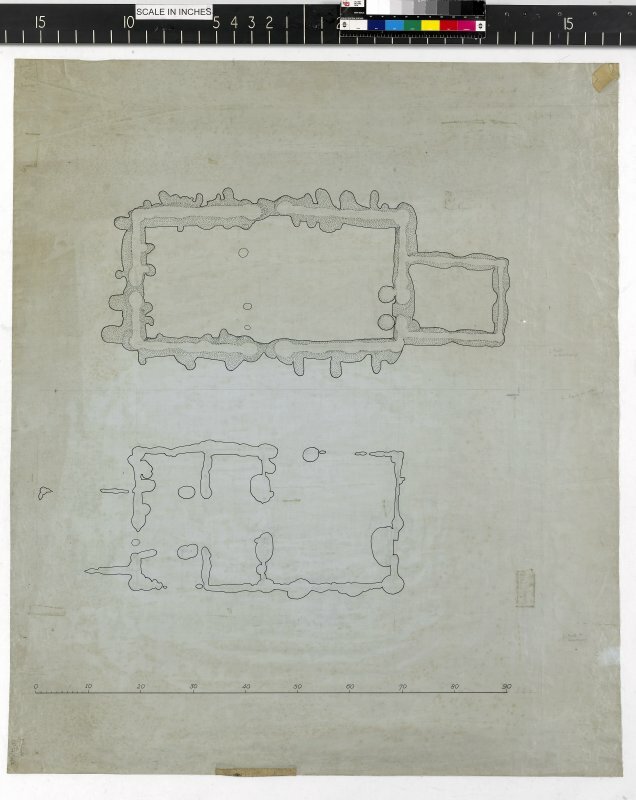 Untitled plan of timber halls. 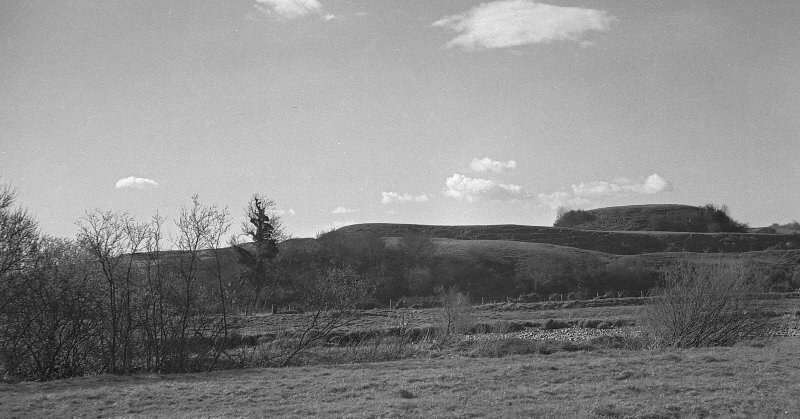 Doon Hill 1966. 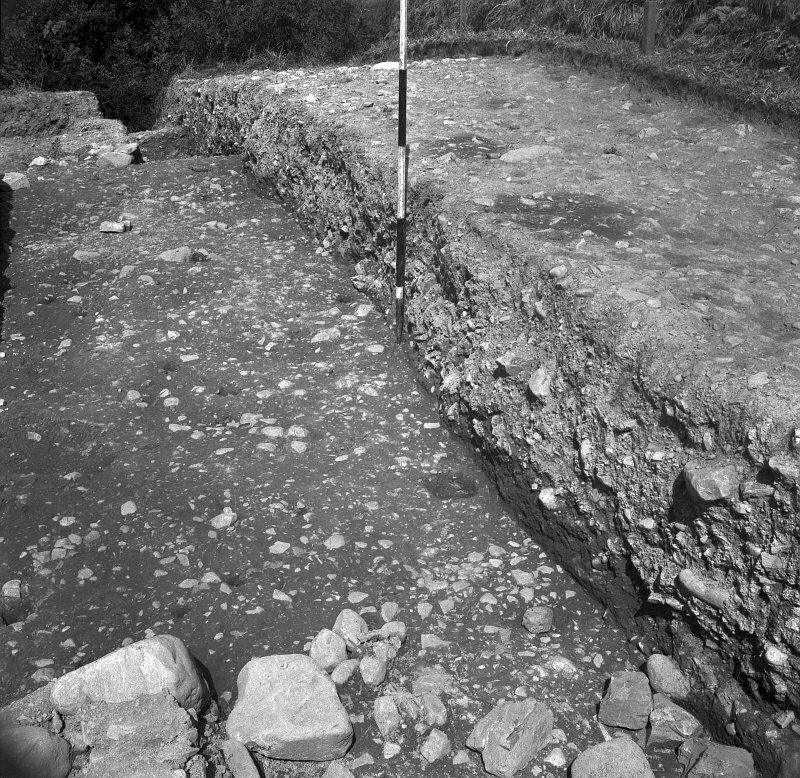 E (W facing side) of palisade trench in easternmost ("entrancework area"). 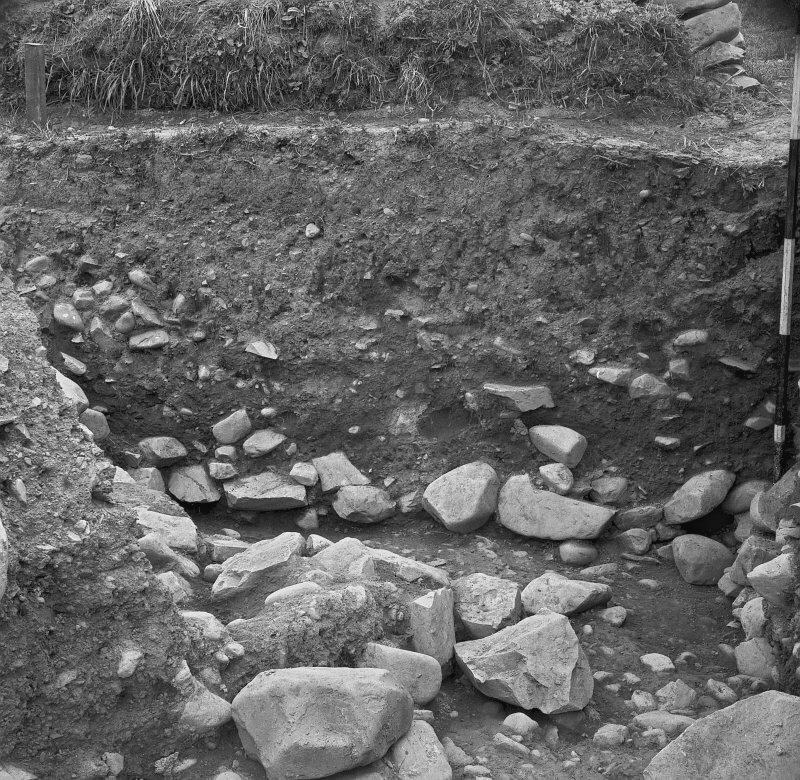 View of the excavation team. 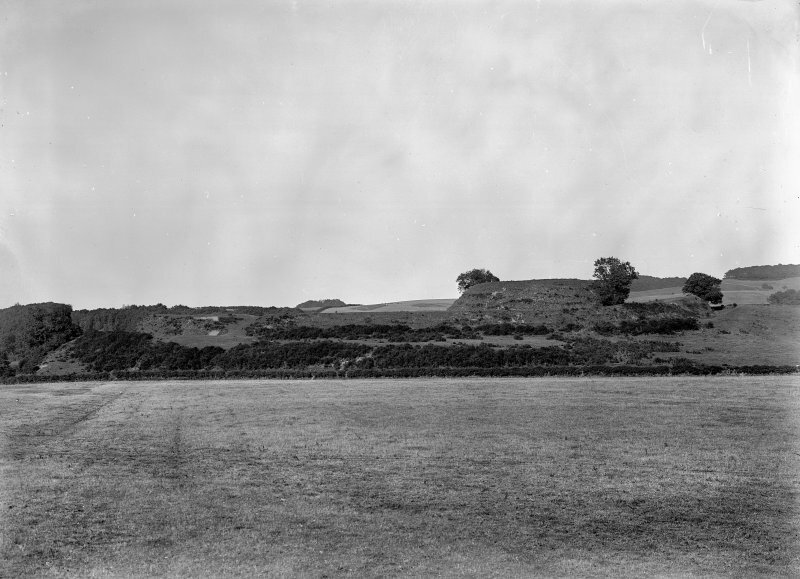 View of the Mote of Urr from the distance. 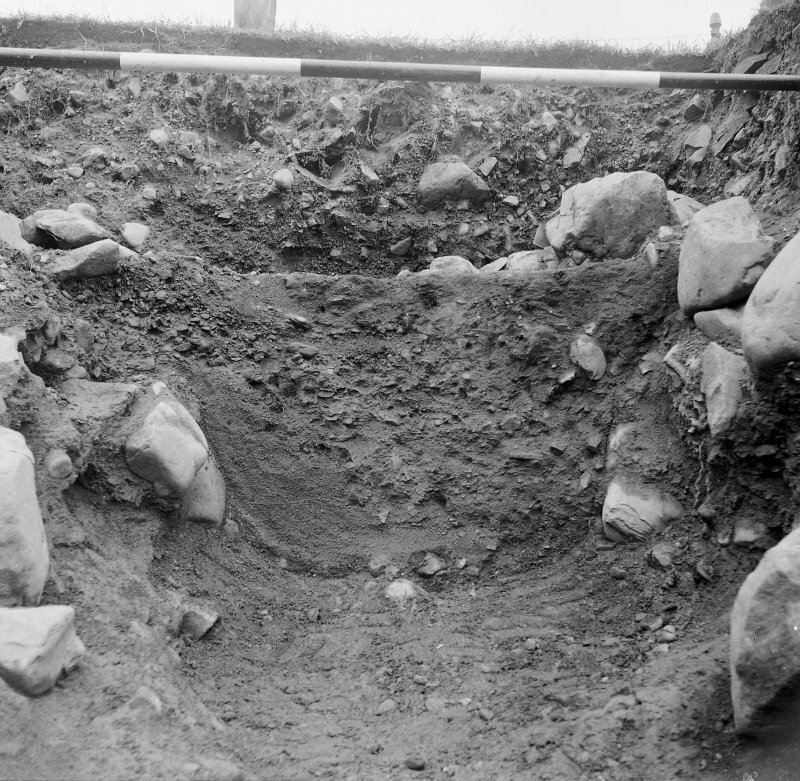 View of octant E of the top of the Mote of Urr in process of excavation. 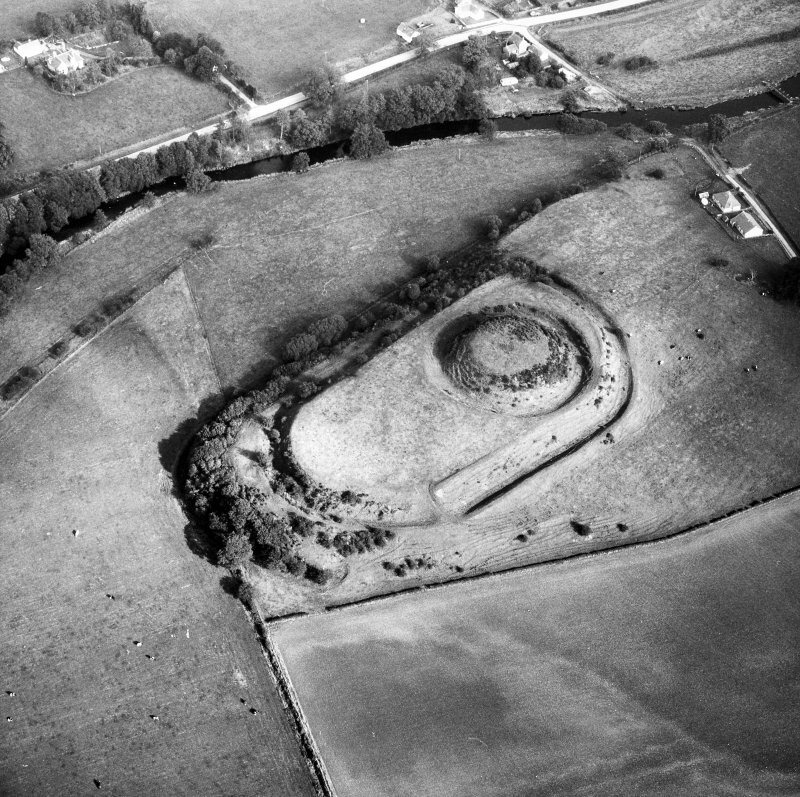 Oblique aerial view centred on the remains of the motte-and-bailey castle, taken from the ESE. 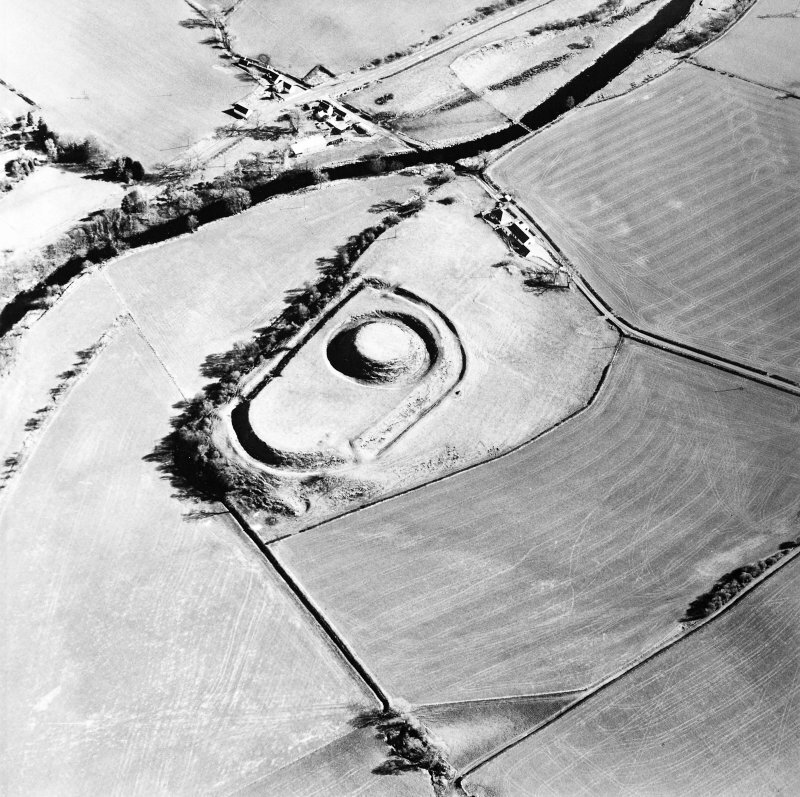 Oblique aerial view centred on the remains of the motte-and-bailey castle, taken from the NE. 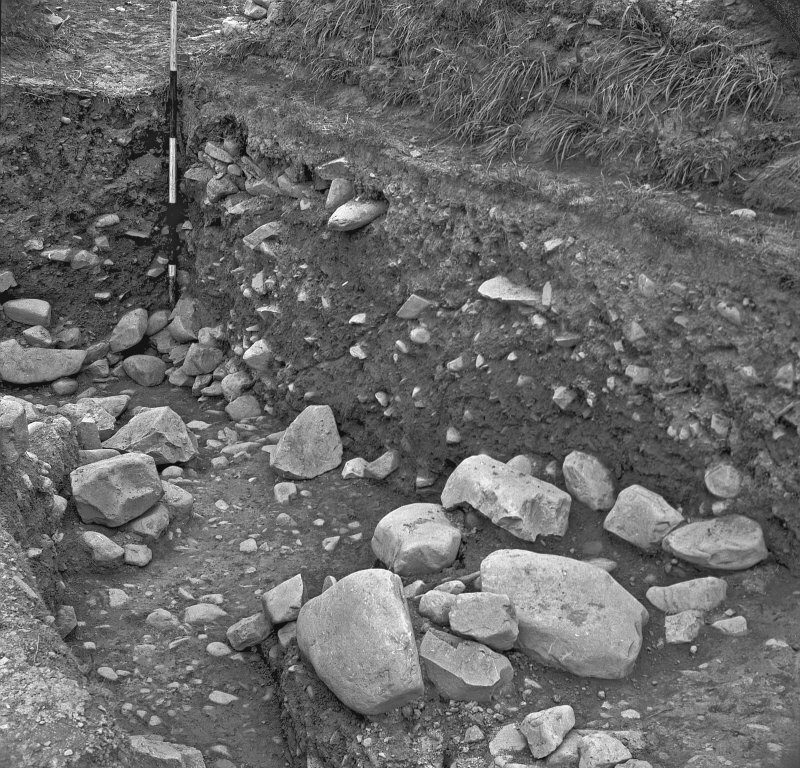 Oblique aerial view of the Mote of Urr, looking N.
List of spot heights from excavations at Mote of Urr. 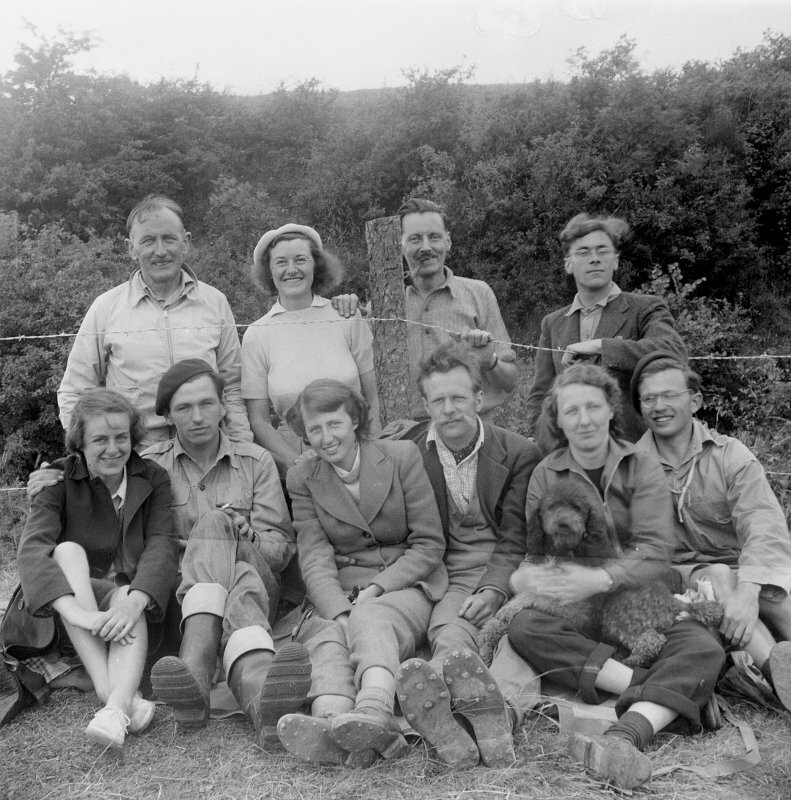 From inside of cover of 1953 Old Windsor notebook. 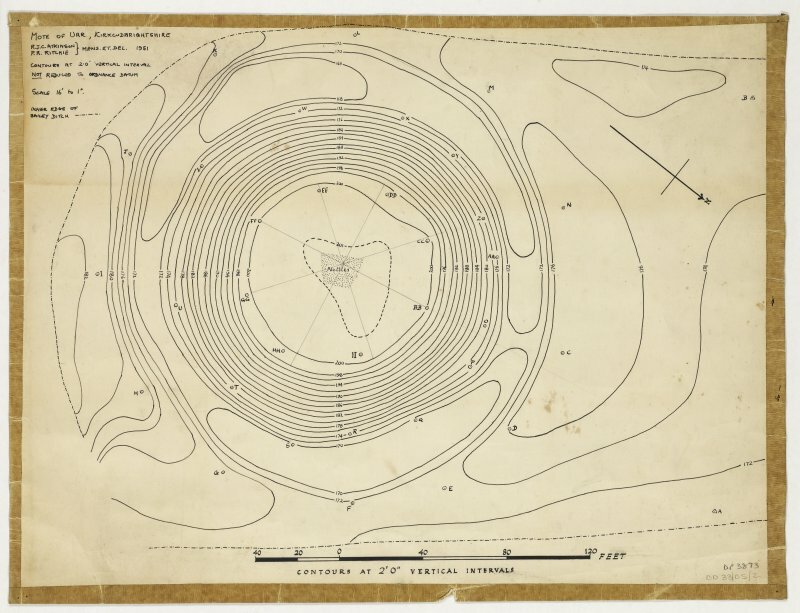 Contour survey of Mote of Urr. 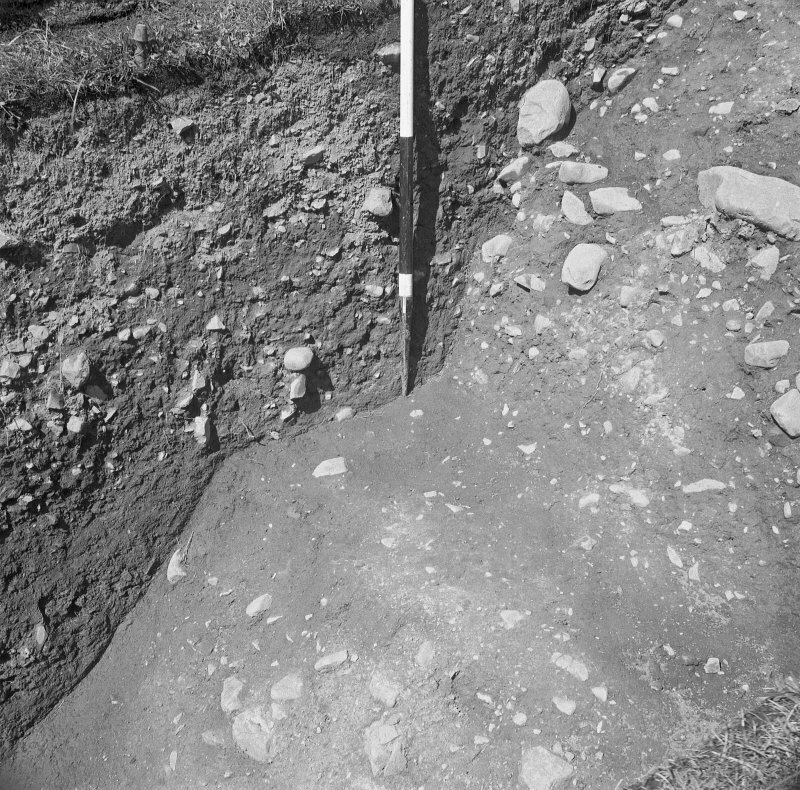 Doon Hill 1966 (13 Sept). 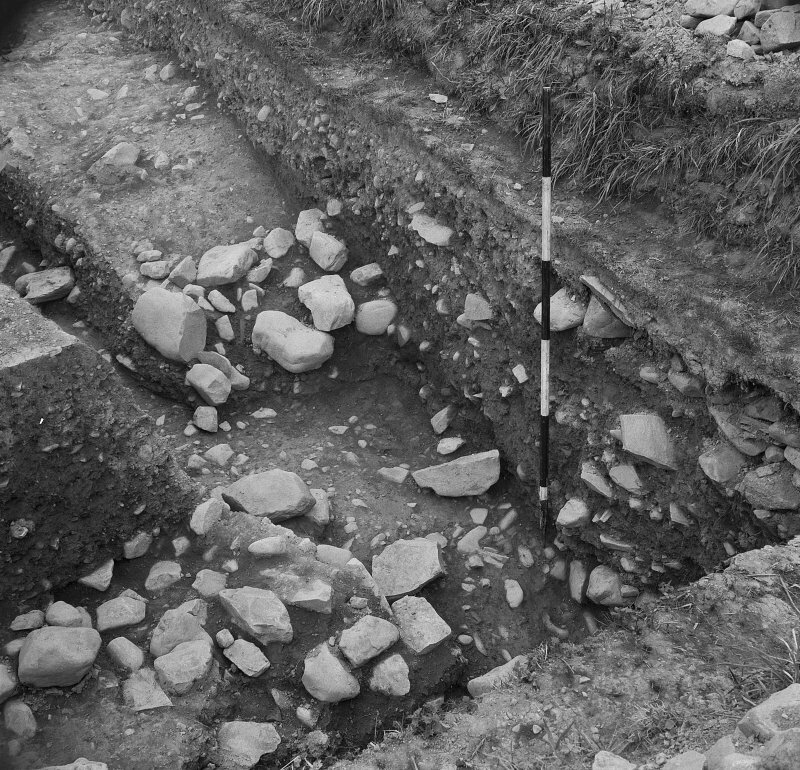 East and west-facing sections of middle N-S strip. 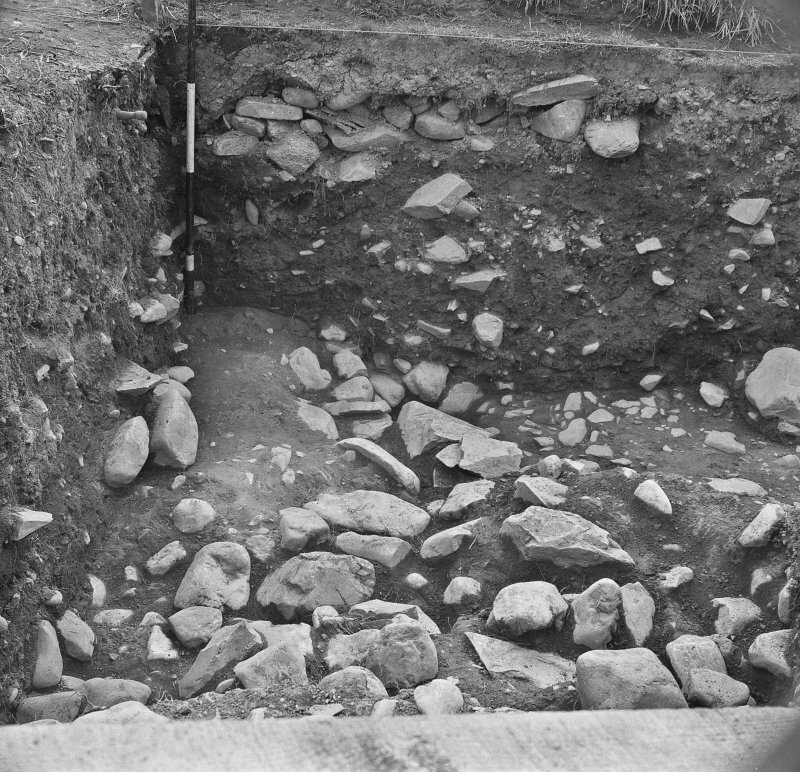 N of entrancework on east side of palisade. 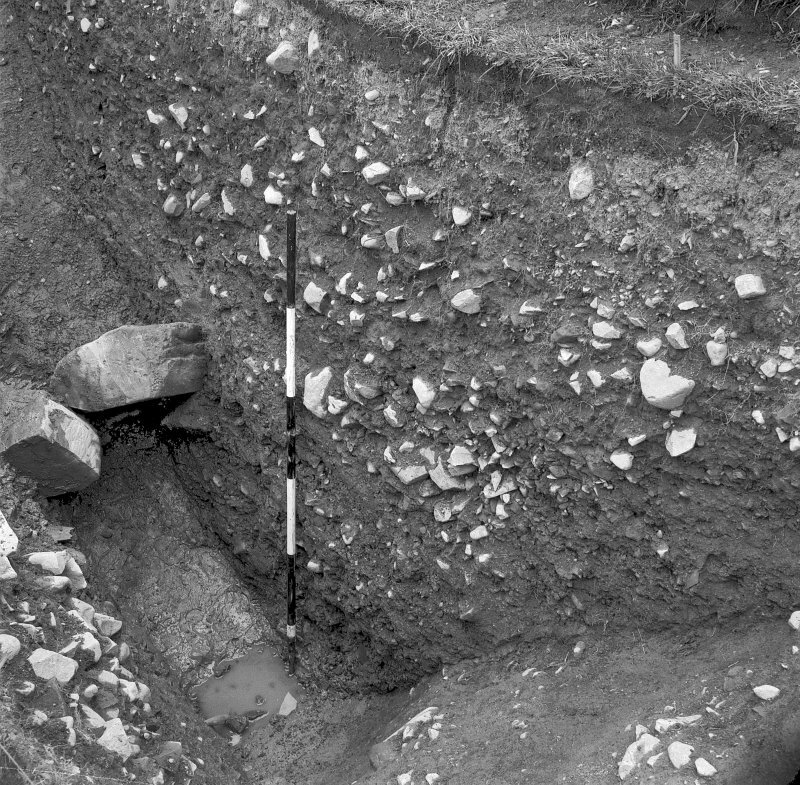 Shallow pit in on the periphery of th motte-top. 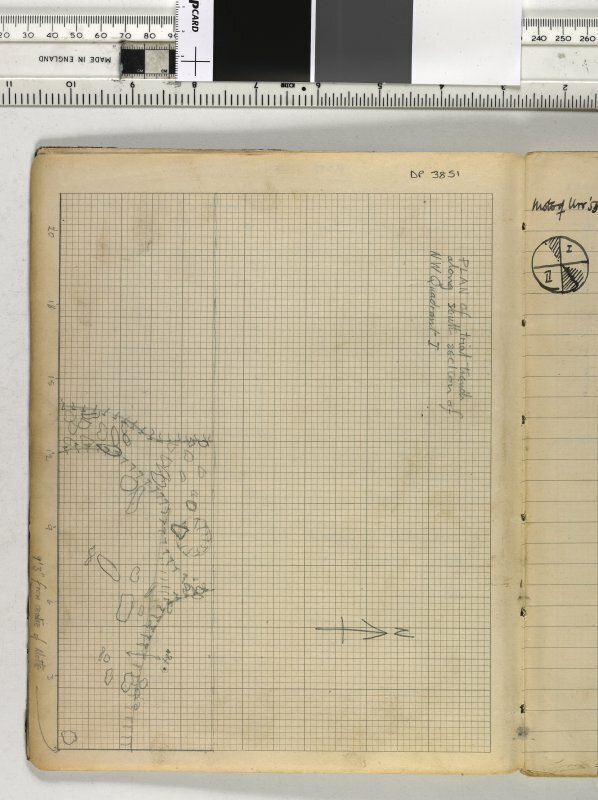 Copy of a Mote of Urr excavation sketch plan of the top of the Motte. 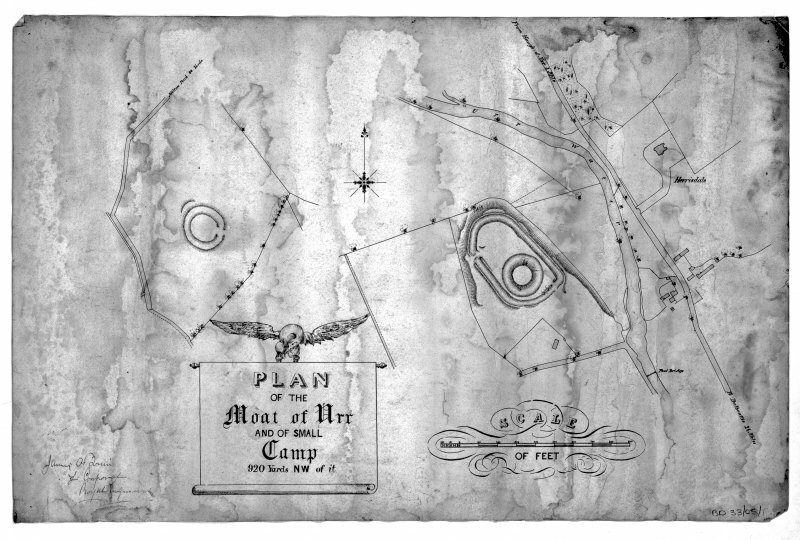 Plan of Mote of Urr and surrounding area. 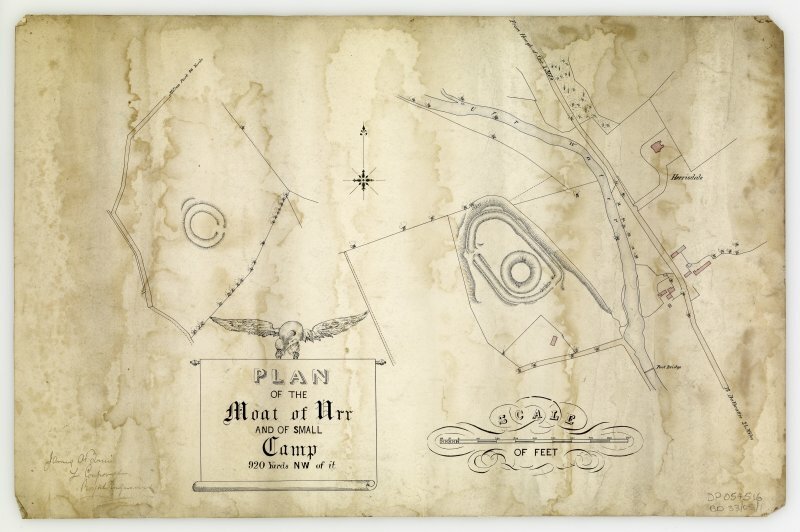 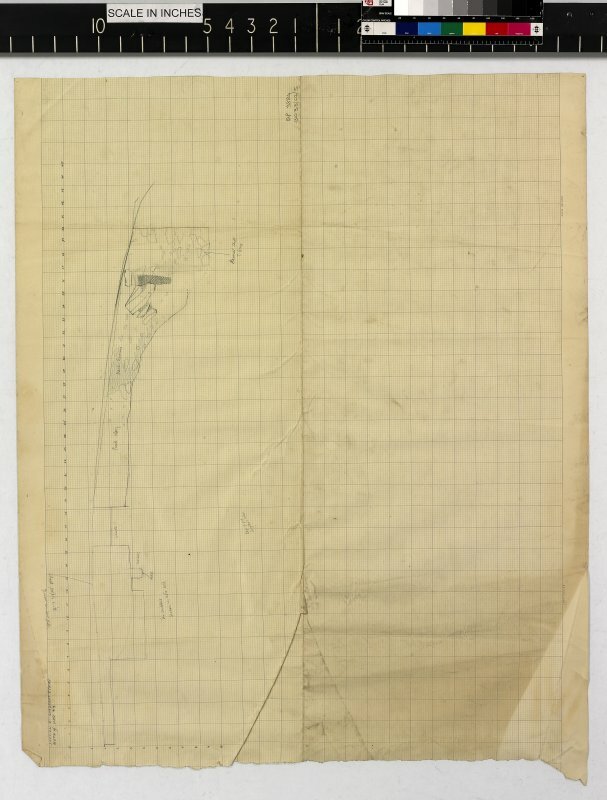 'Plan of the Moat of Urr and of small camp 920 yards NW of it'. 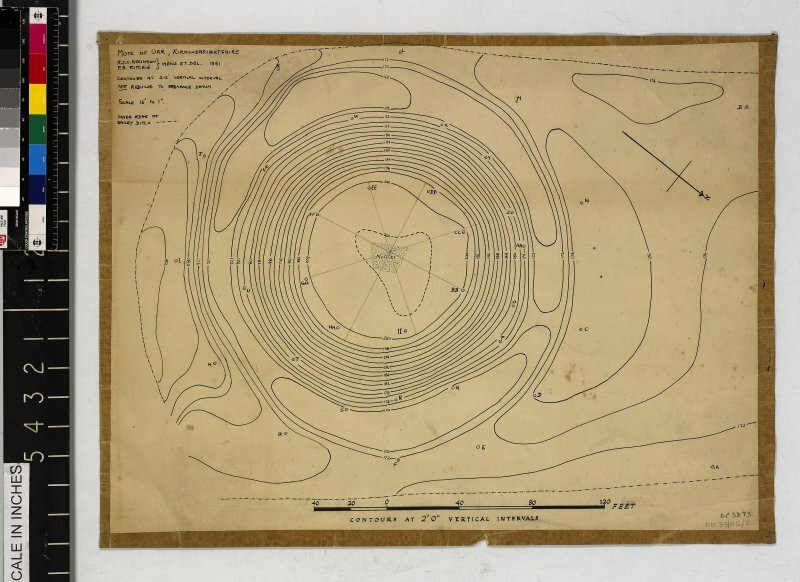 Plan of the excavations. 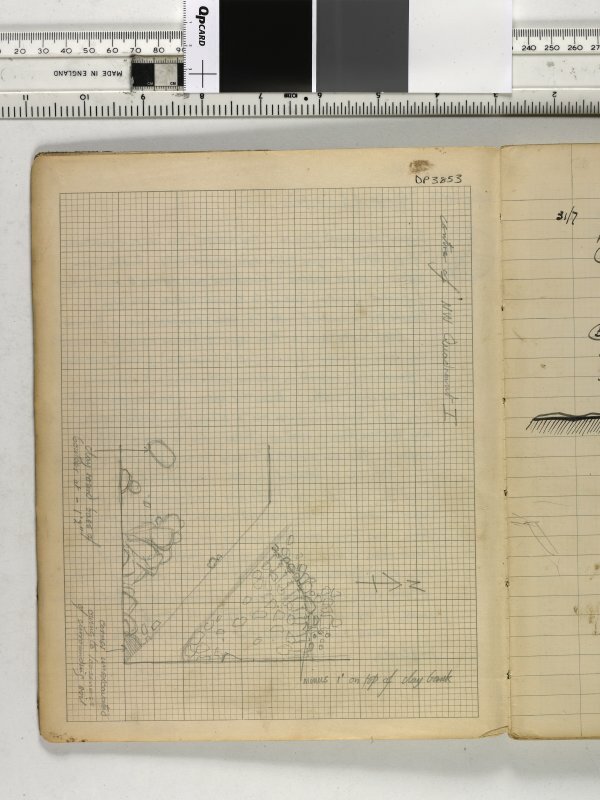 This was originally catalogued as Mote of Urr, but probably relates to Old Windsor, Berkshire. 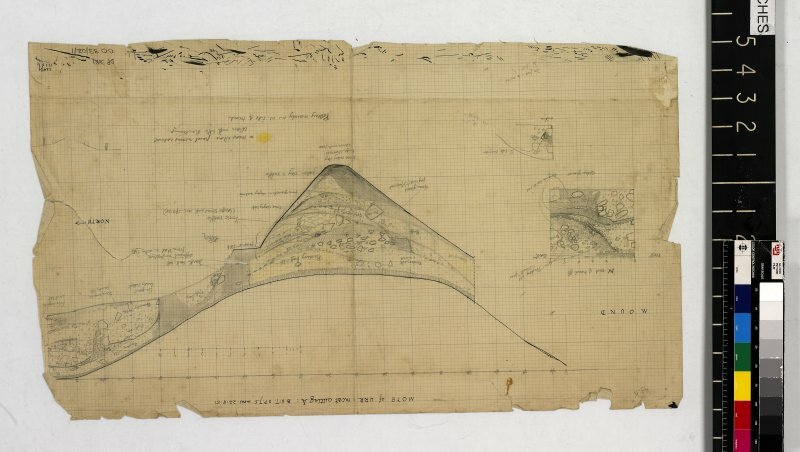 Copy of section drawing on lined graph paper titled 'Mote of Urr: Octrant E, N section. 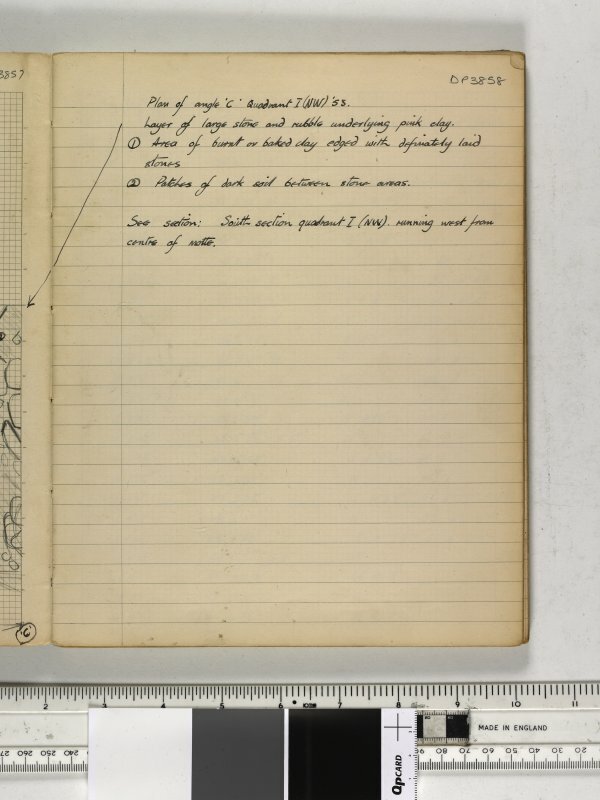 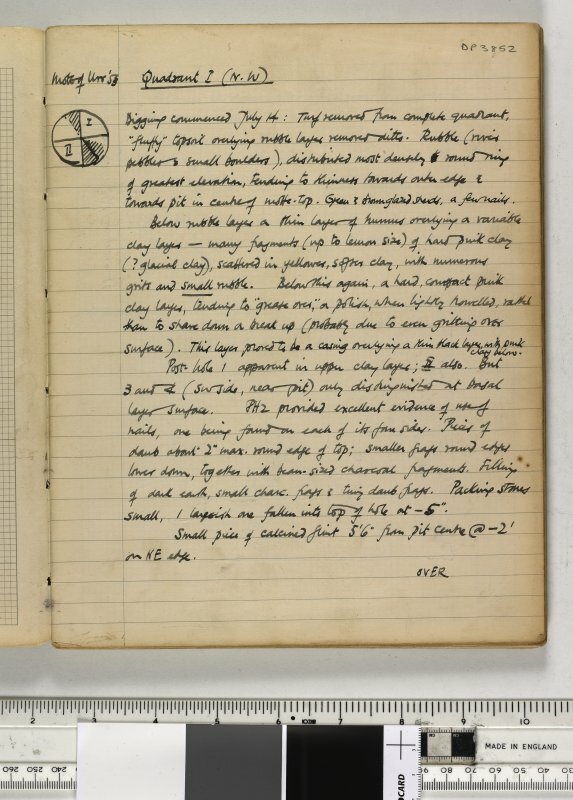 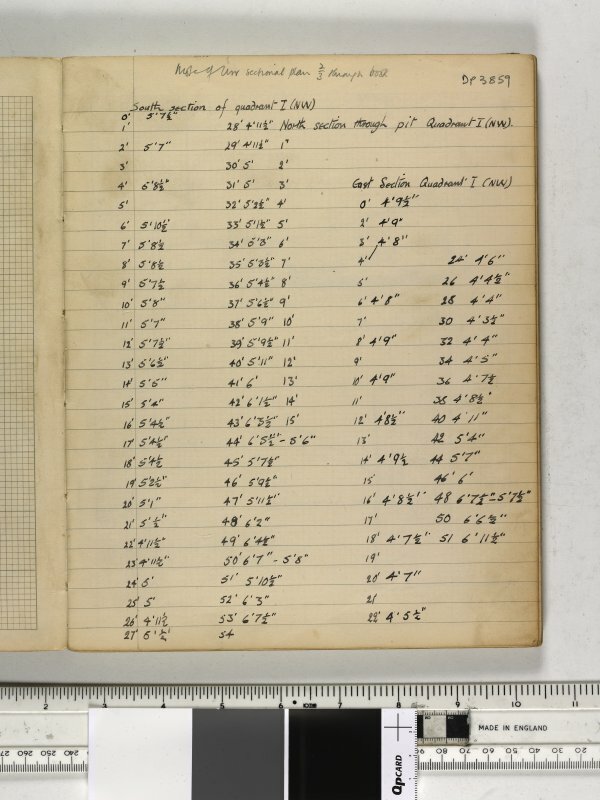 Notebook title 'OW 1953, 1954' containing notes from Old Windsor and Mote of Urr. 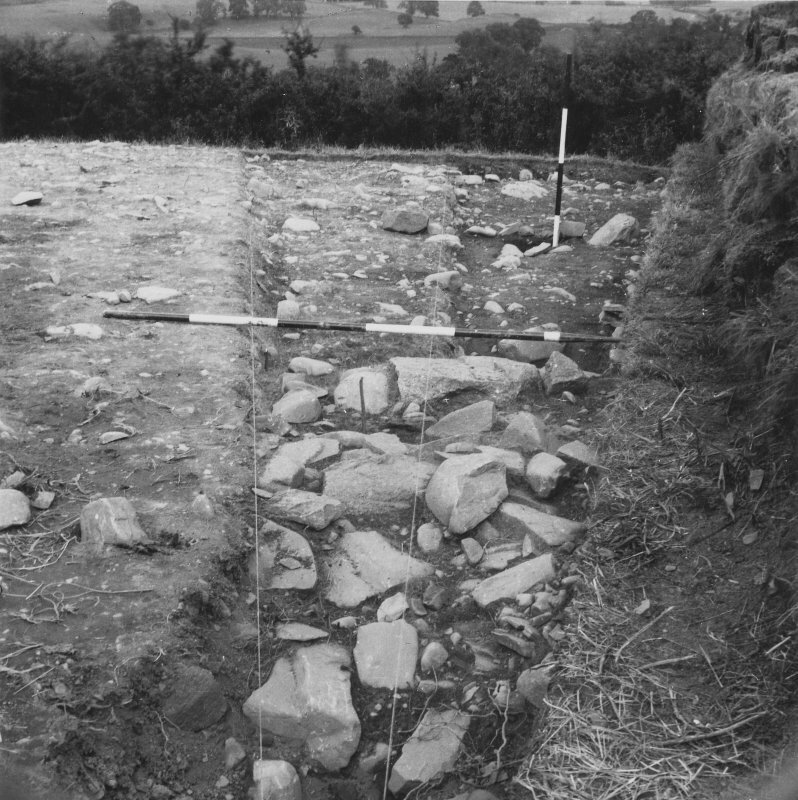 Stone ridges. 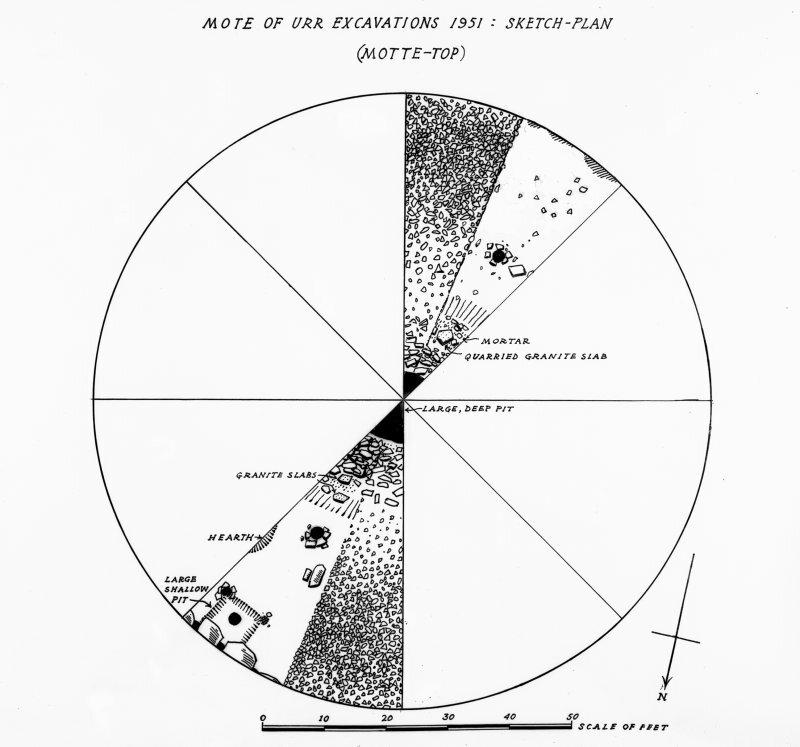 Excavation drawing of East section quadrant I (NW) of Mote of Urr. 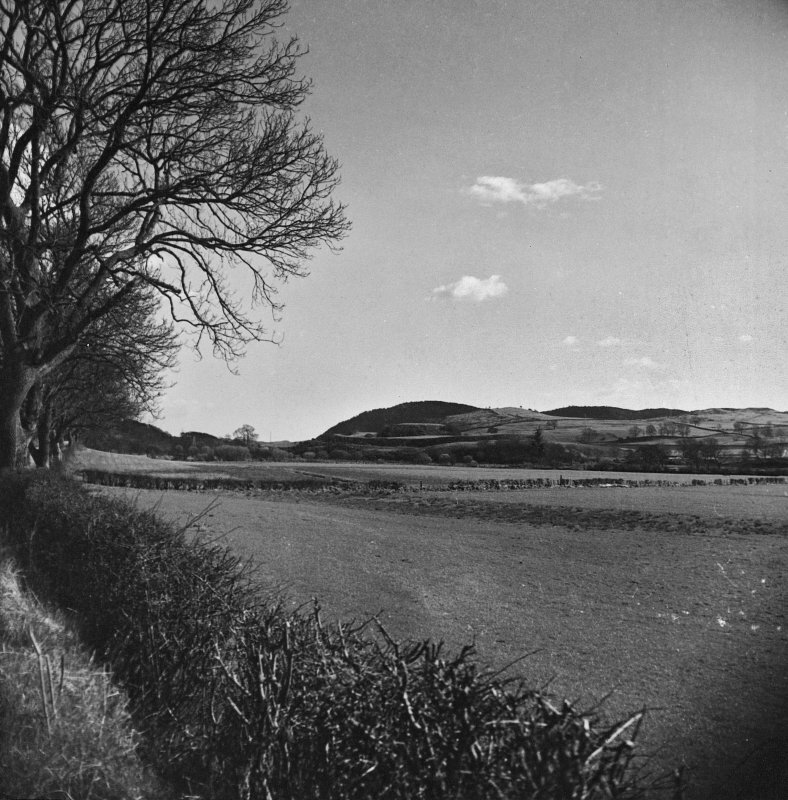 View of cutting across the ditch at the Mote of Urr, seen from the side of the mound. 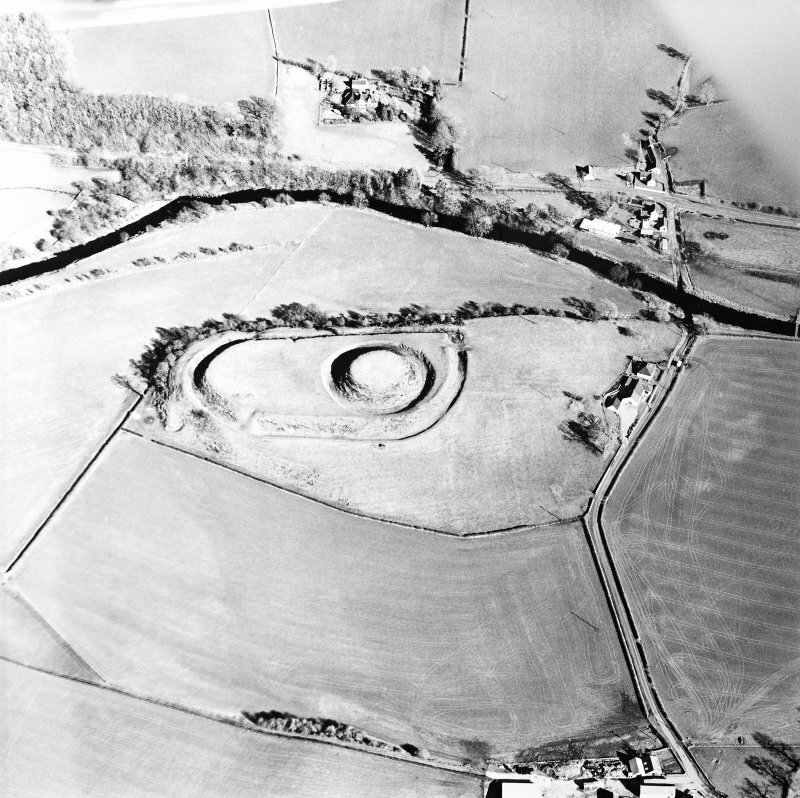 Oblique aerial view centred on the remains of the motte-and-bailey castle, taken from the WSW. 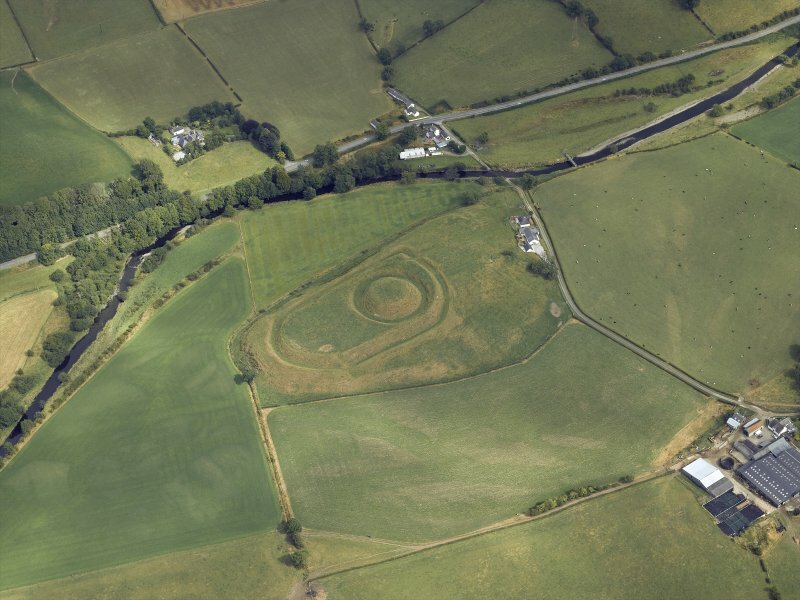 Oblique aerial view centred on the remains of the motte and bailey castle, taken from the WNW. 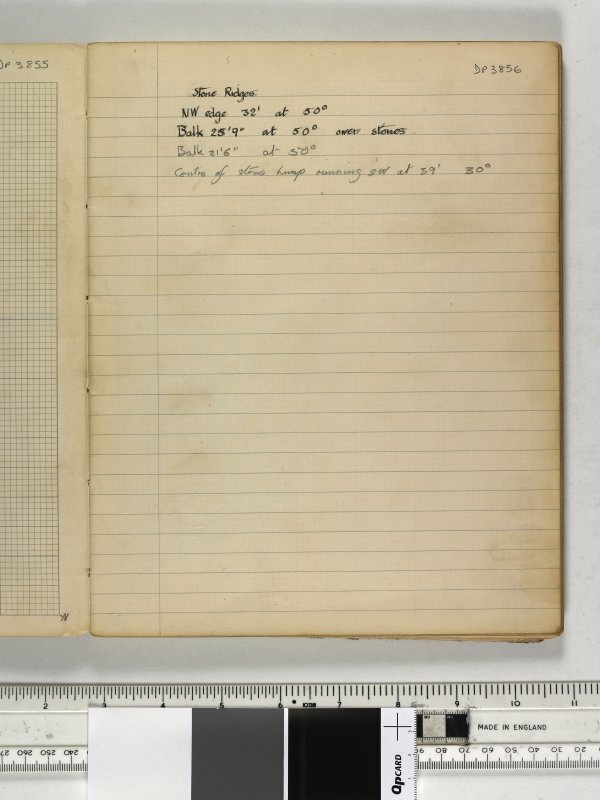 Notebook title 'OW 1953, 1954' containing notes from Old Windsor and Mote of Urr. 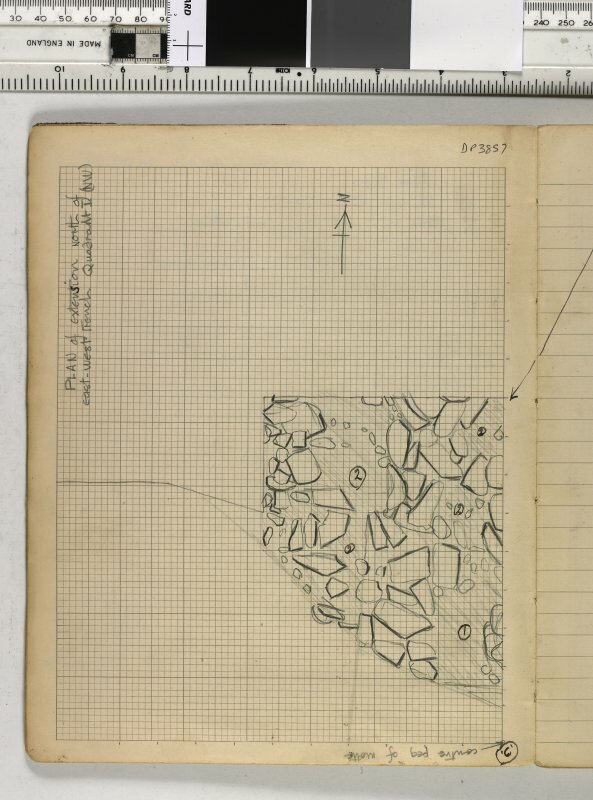 Small sketch plan of area with reference point marked as 1951 centre peg. 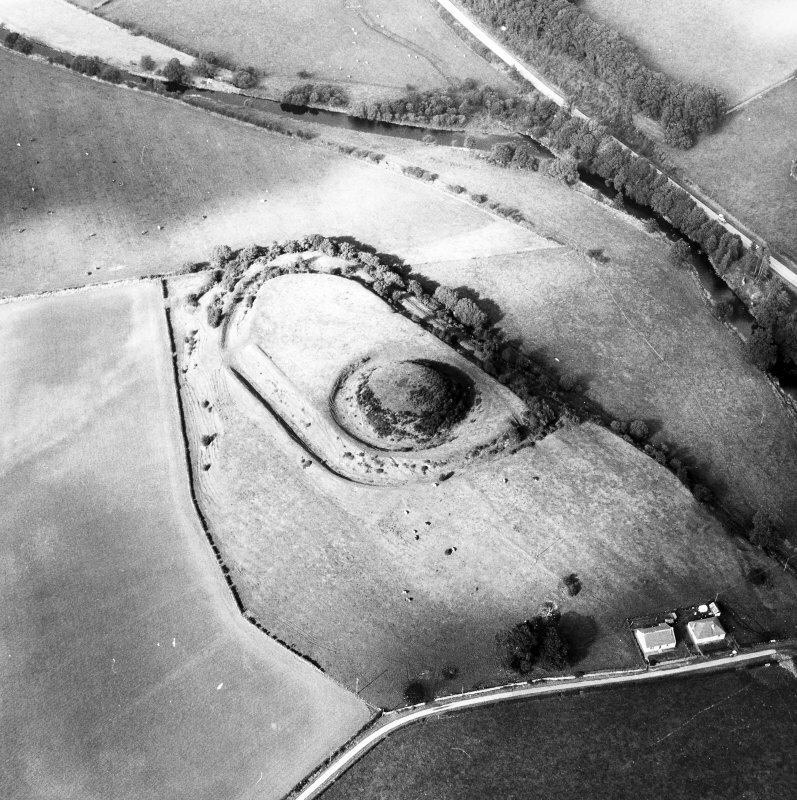 Postcard view of Mote of Urr. 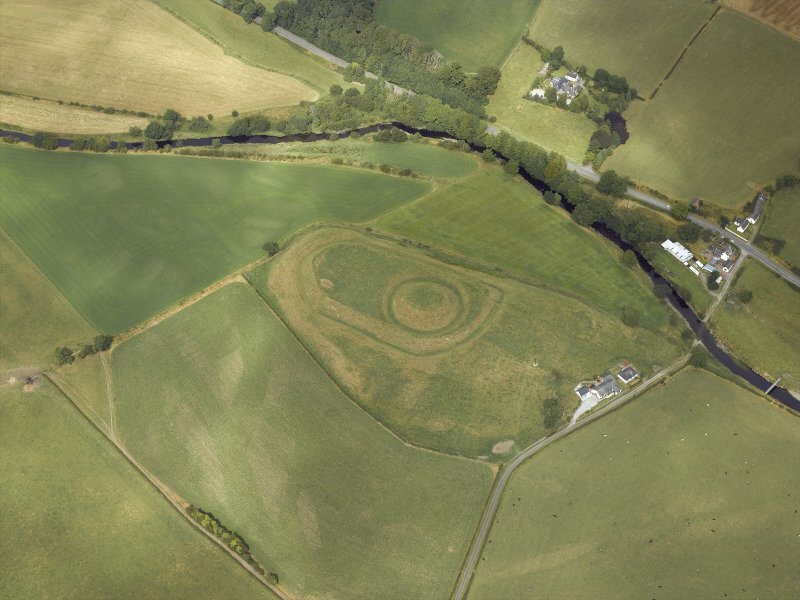 Oblique aerial view centred on the remains of the motte-and-bailey castle, taken from the S.
Oblique aerial view of the Mote of Urr, looking E.
For successor structures, see NX86SW 6 and NX86SW 10. 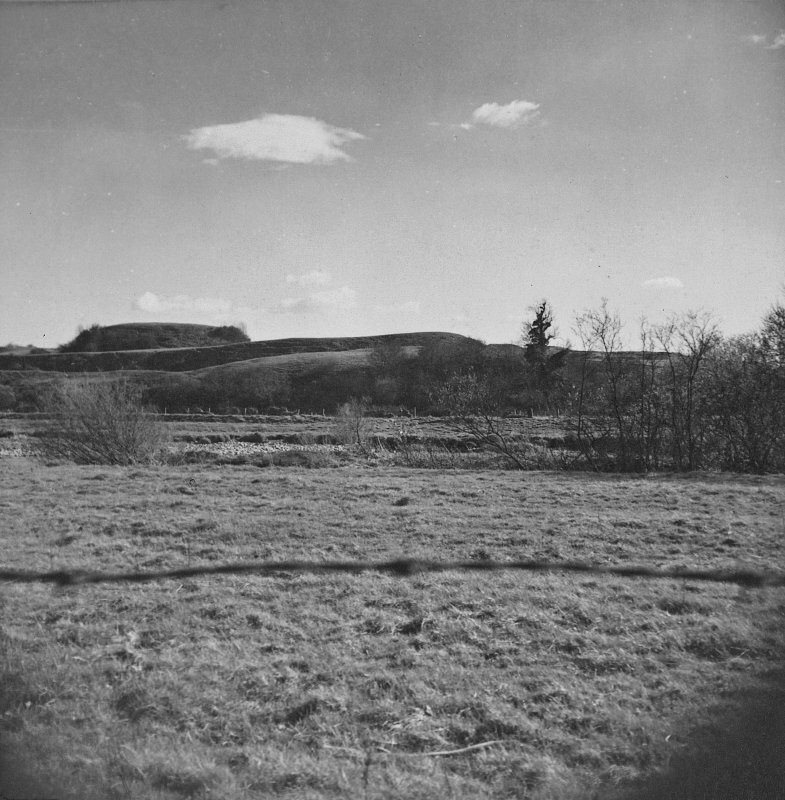 A motte and bailey, excavated by Hope-Taylor in 1951 and 1953. 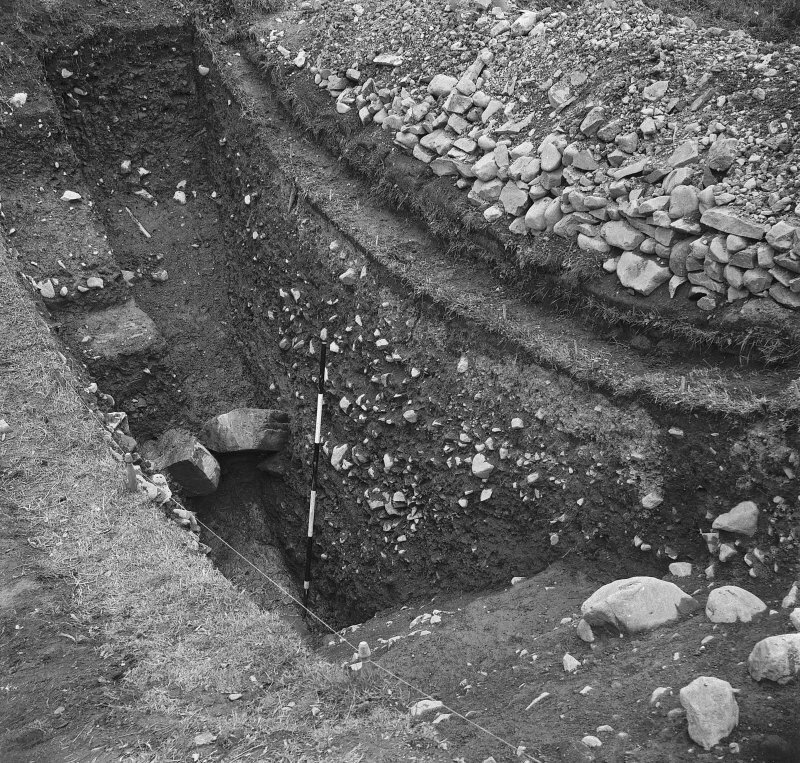 RCAHMS 1914, visited 1911; B Hope-Taylor 1953; A Truckell and J Williams 1967. 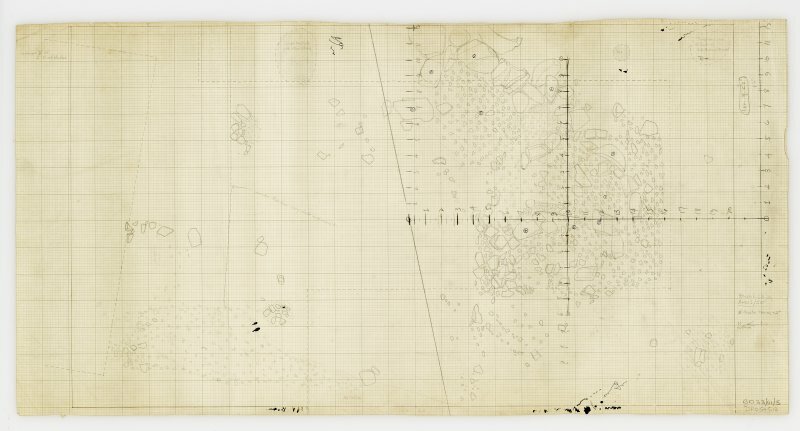 Mote of Urr as described and planned. 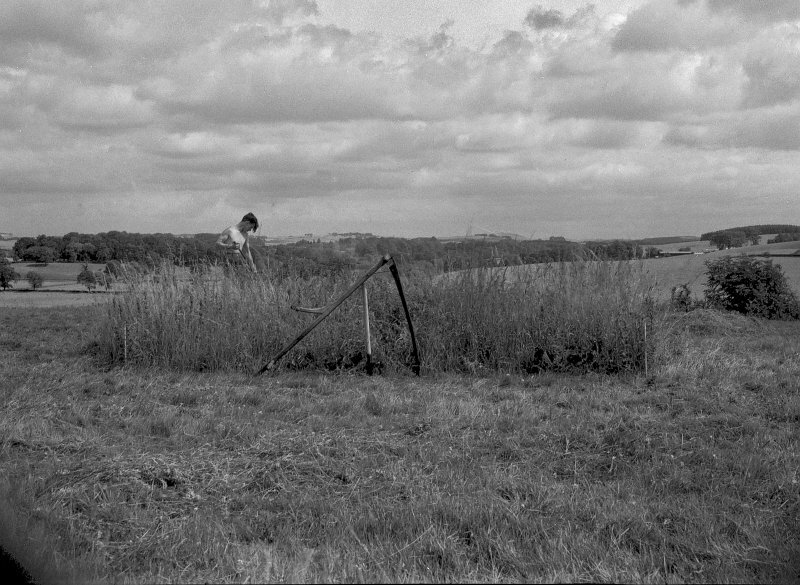 Visited by OS (WDJ) 15 July 1969. 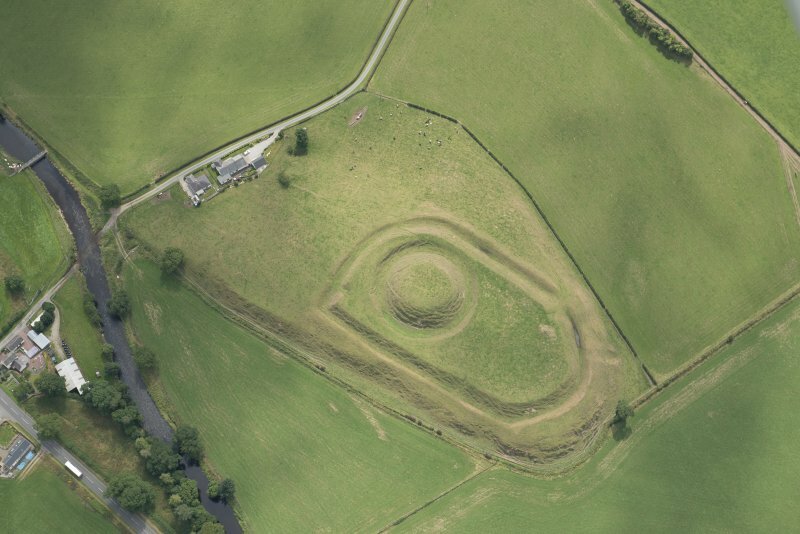 Covering an area of about 2 hectares, this truly impressive earthwork is the most extensive motte-and-bailey castle in Scotland. 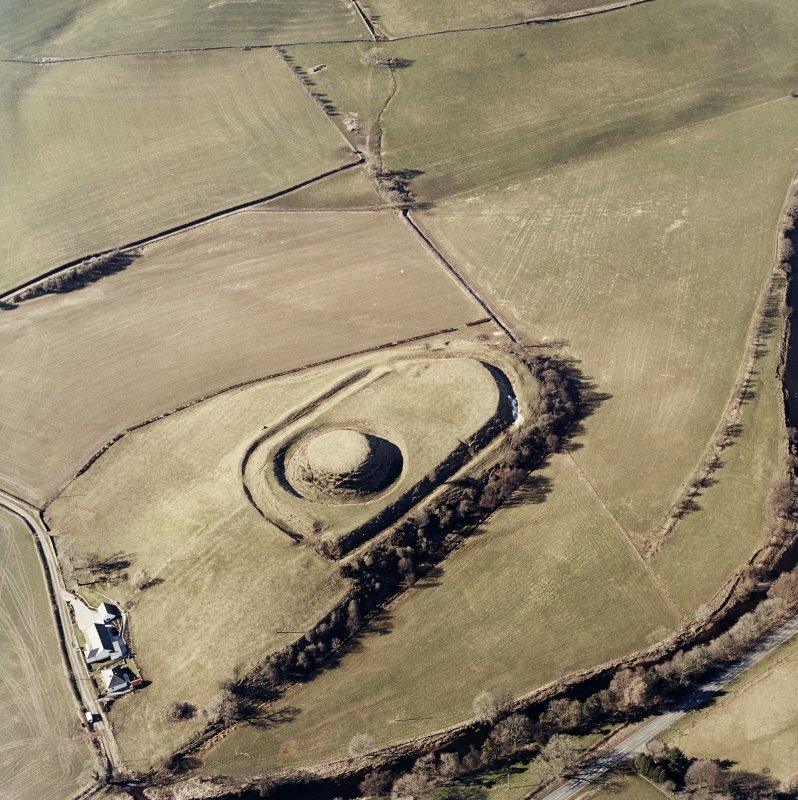 Only perhaps from the air can one appreciate its great size, looking for all the world like some great earthen battleship stranded on the alluvial river plain. 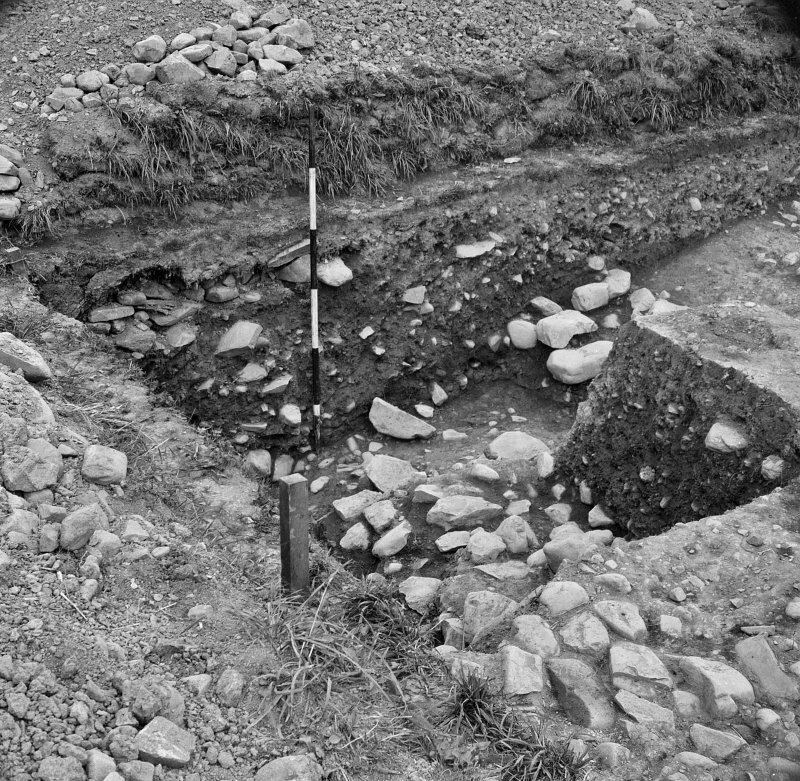 Its position in the valley is not especially commanding; it may originally have been an island, but the river now flows in a single channel to the east. 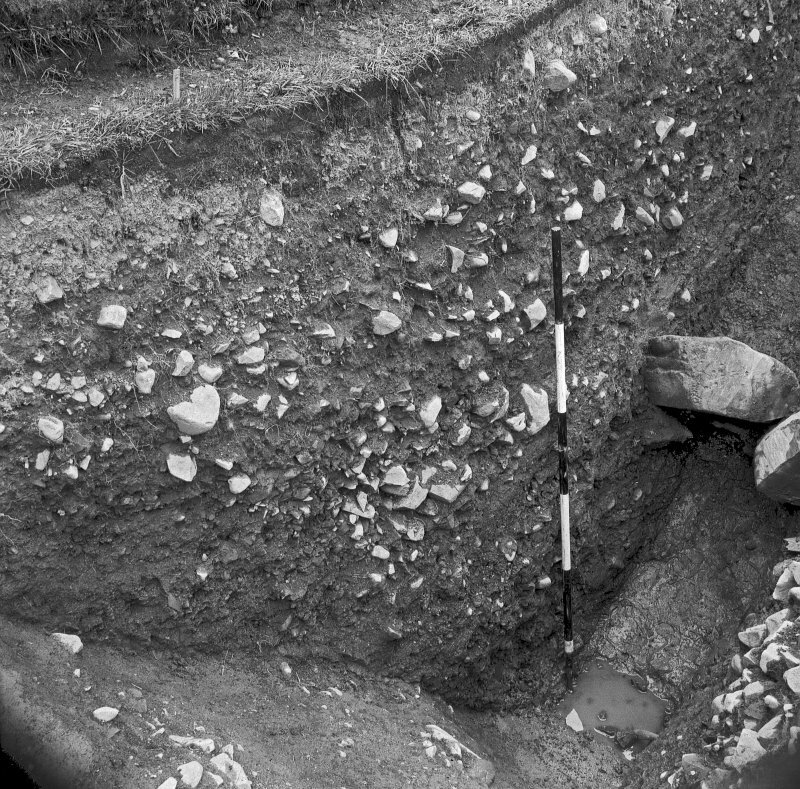 Close up, its deep outer ditch puts one in mind of an iron-age hillfort, and it is possible that the bailey was developed out of an existing fortification in Anglo-Norman times. 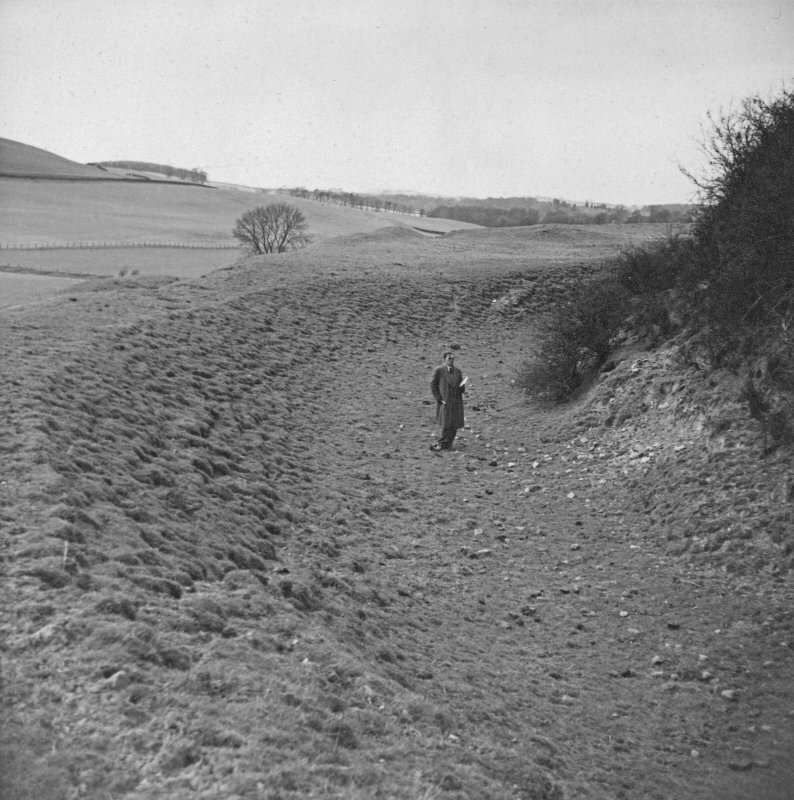 The lower slopes have been artifIcially scarped on the north and east. 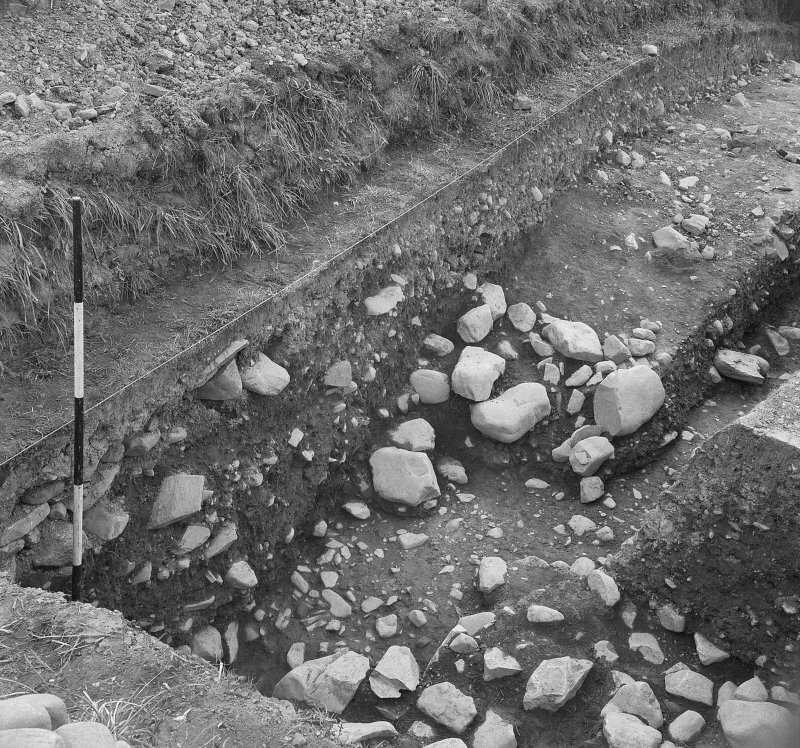 A 15m-wide ditch surrounds the entire work, and is bridged by causeways in the south-eastern and north-western sectors. 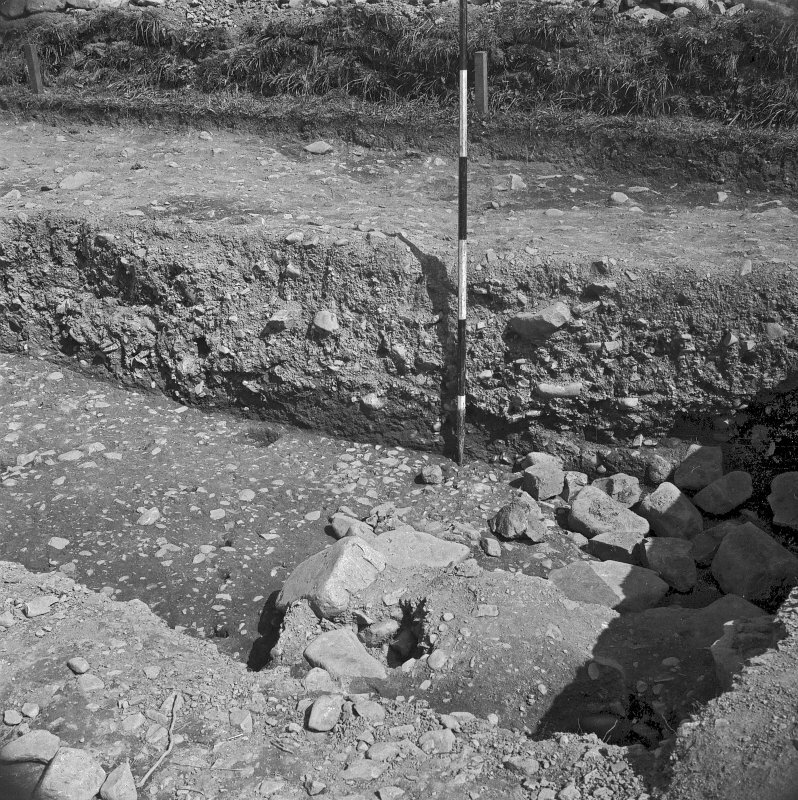 Low counter scarp banks can be seen around the lips of this ditch, and the enclosure thus formed is about 150m in maximum length. 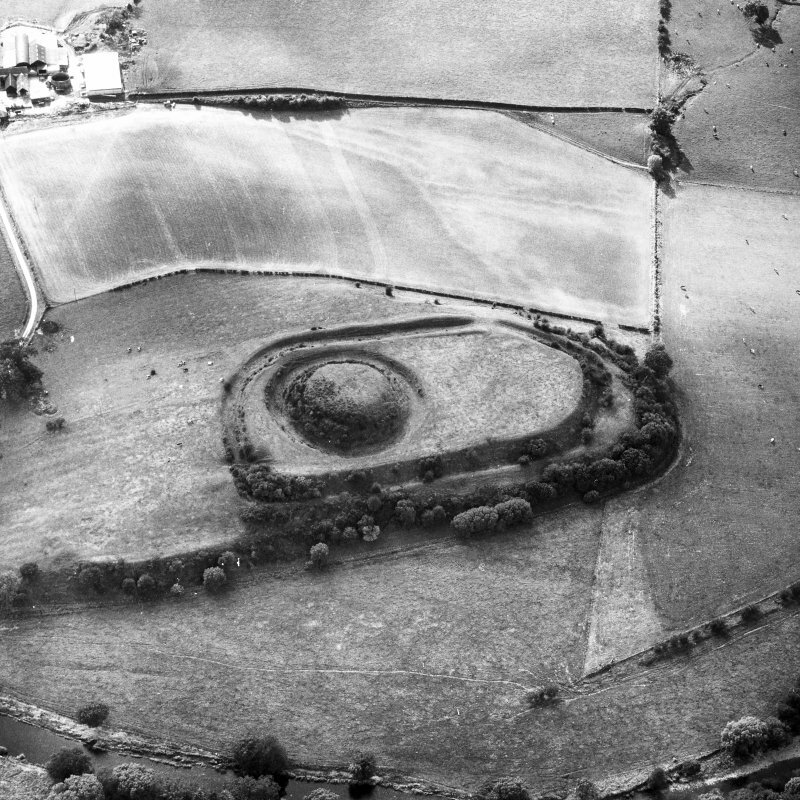 The motte itself, set within its own ditch,occupies most of the southern end of the enclosure; it rises in the usual 'pudding' or truncated cone form to a sub-circular summit area. 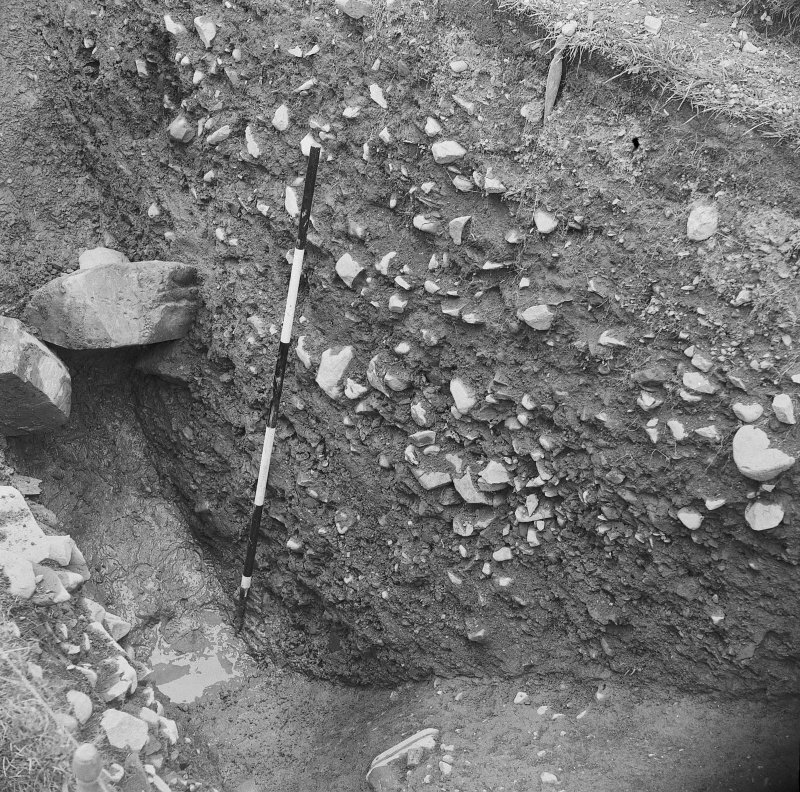 Archaeological excavation of part of the motte top showed that the upper 1.83m had been added following the destruction by fire of 12th century timber buildings and palisades; coins and pottery in the upper levels indicated that occupation had continued into the 14th century. 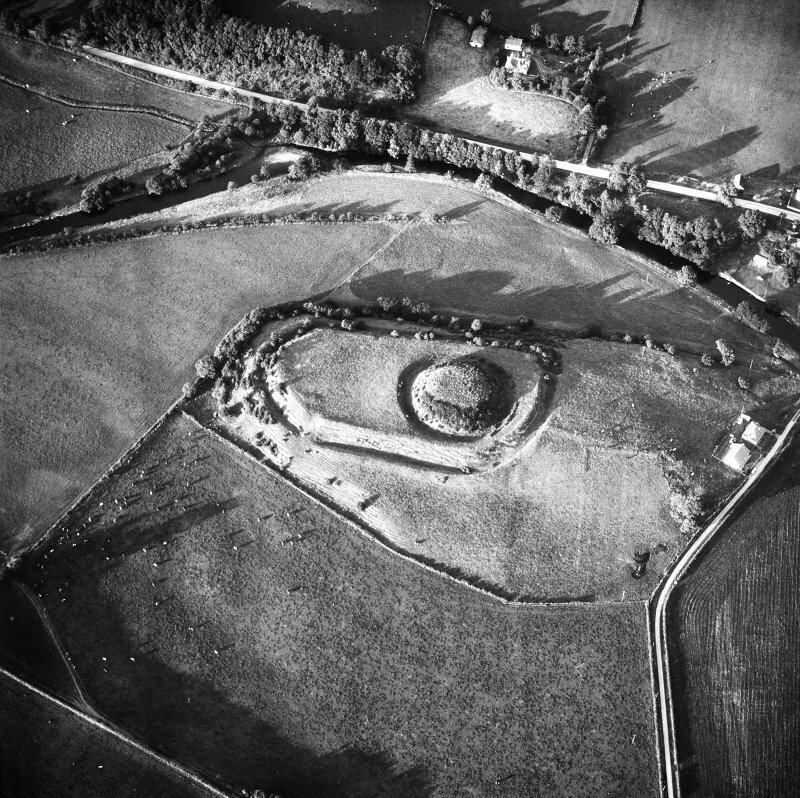 The earliest available records show the lordship of Urr in the possession of Walter de Berkeley (d. c 1194), chamberlain of William I. 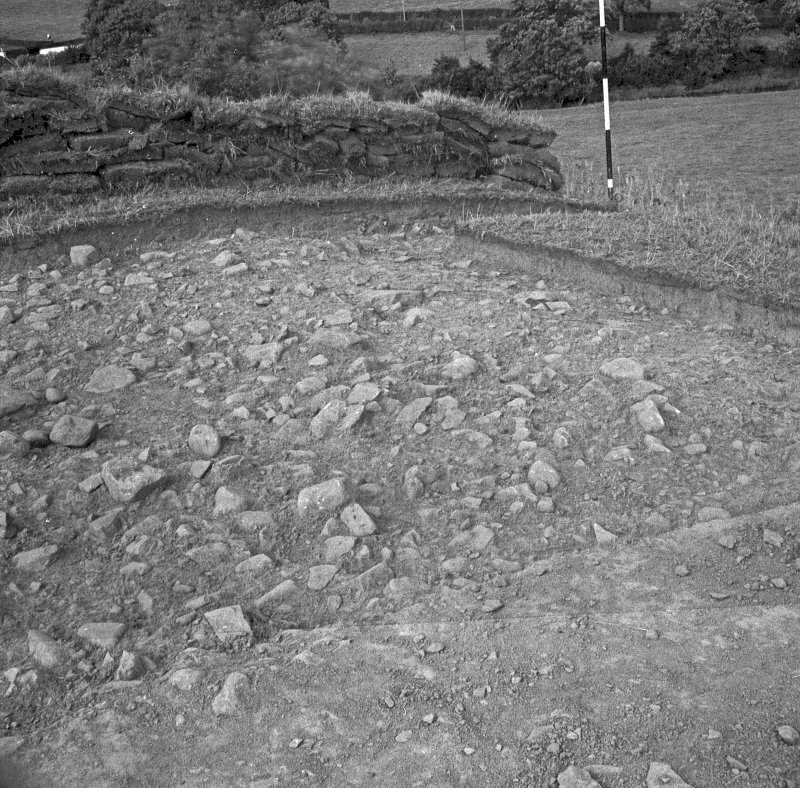 From him it passed by marriage to a cadet branch of the Balliols, the main line of that family later occupying nearby Buittle Castle. 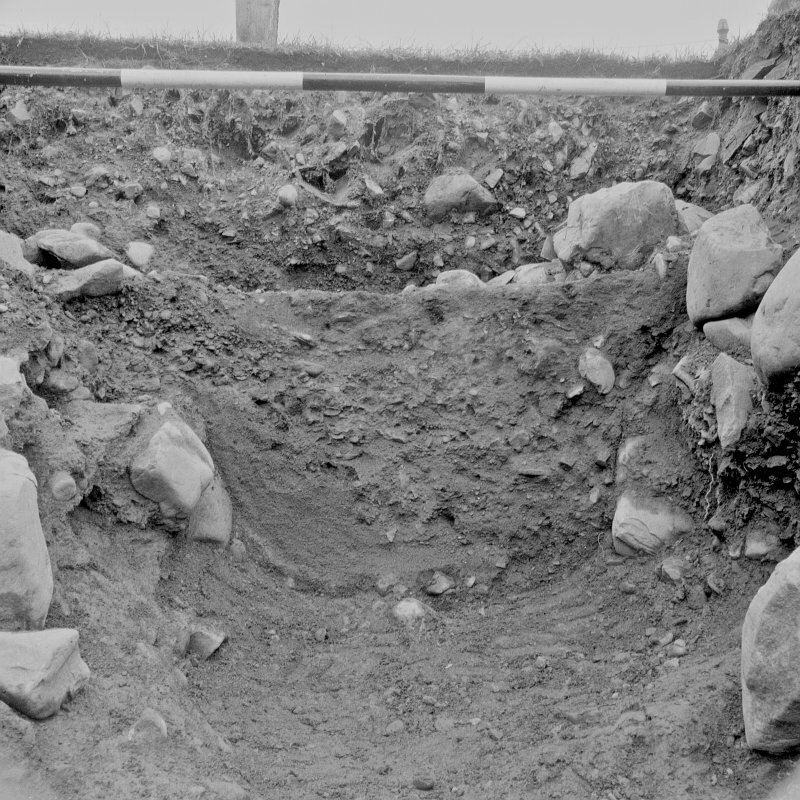 Two witnesses to a Balliol of Urr charter of 1262 were described as burgesses of Urr, but where this burgh settlement was located, whether inside or outside the bailey, and how long it lasted, are not known. 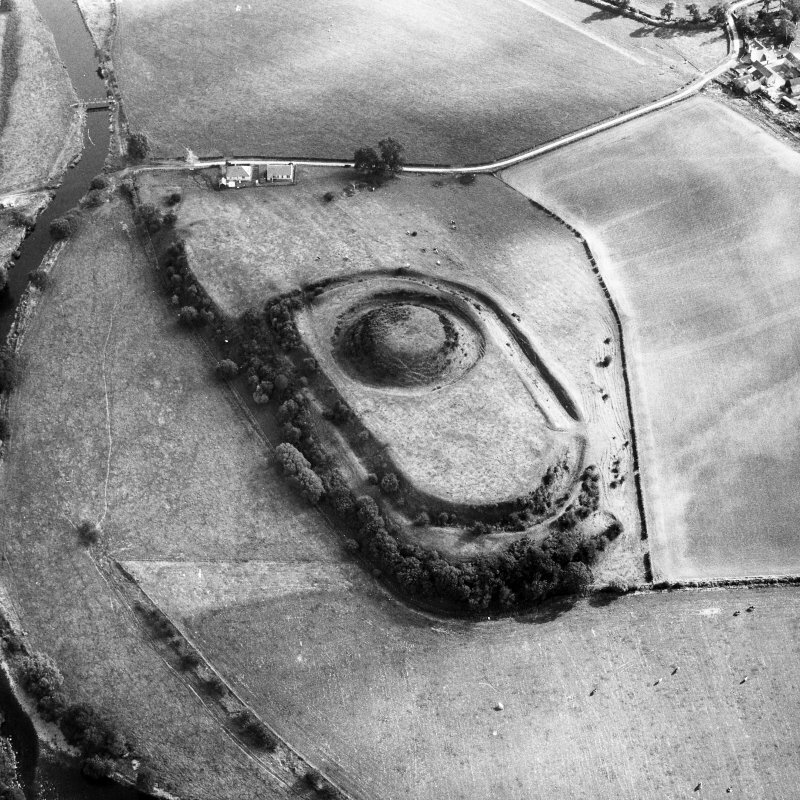 The Mote of Urr is the earthwork remains of a 12th century timber castle known as a motte-and-bailey. 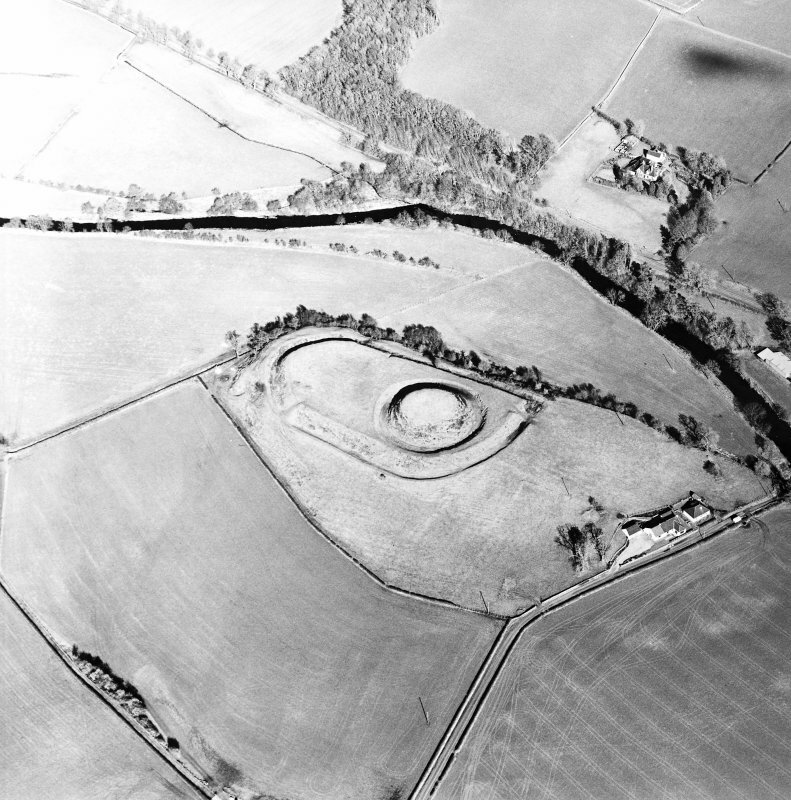 It lies 4km north of Dalbeatie in the valley of the Urr Water, and standing on the edge of an old river cliff dominating the haughland of the river it is a very visible feature in the landscape. 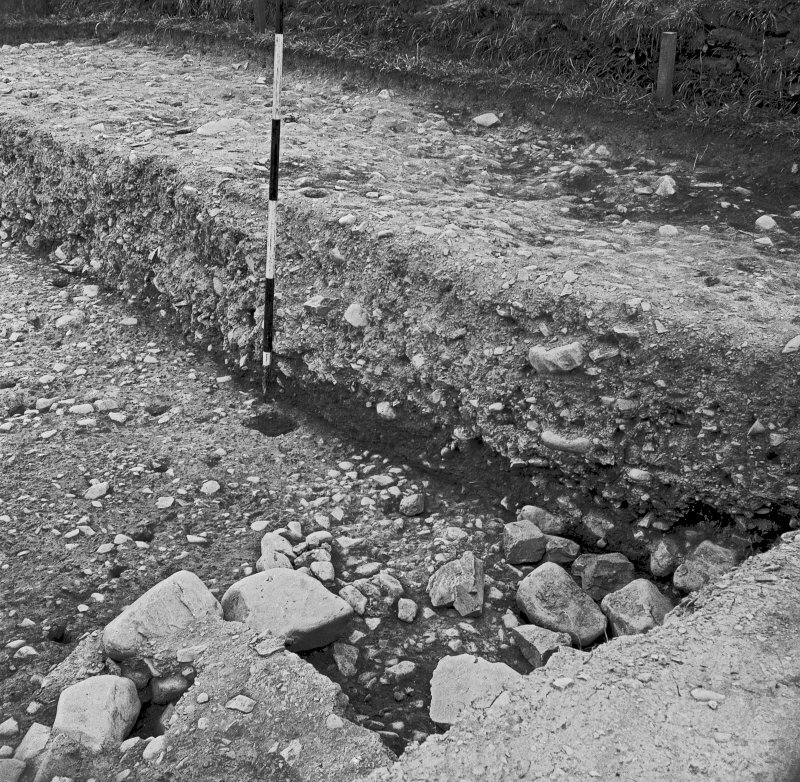 The river now flows along the east side of the castle, but when it was built it almost certainly flowed along its west side. 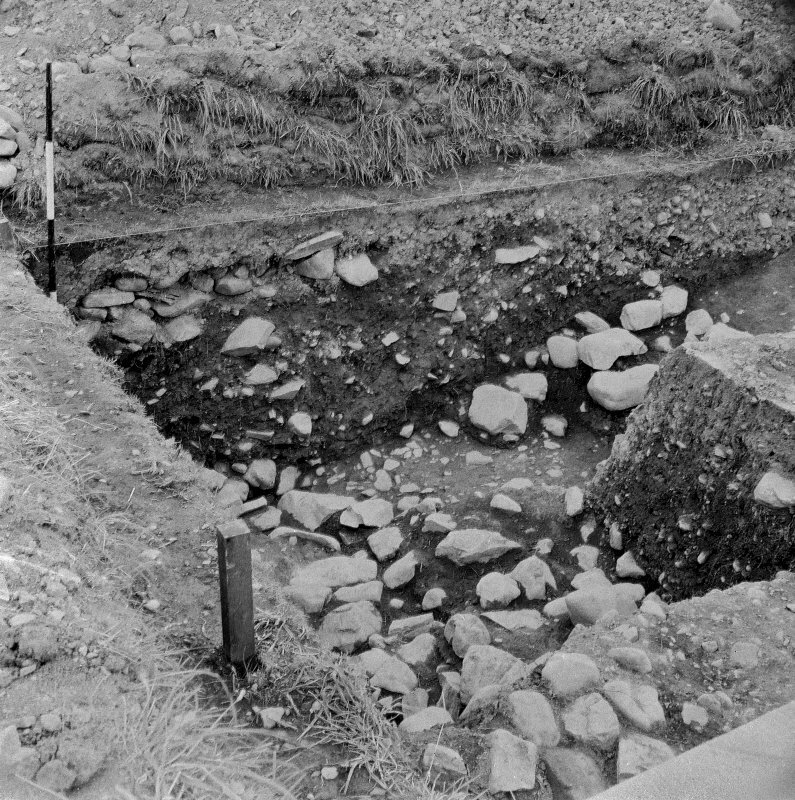 We know this because the parish boundary follows the course of the Urr Water, preserving its line when the boundary was settled, possibly around the time the castle was built. 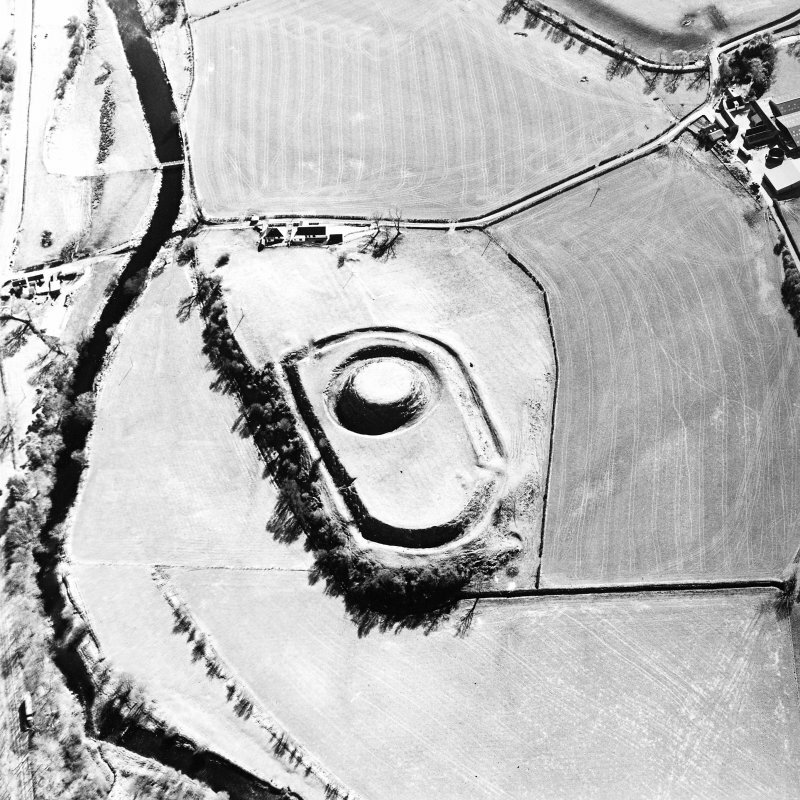 The castle comprises a steep-sided, conical, flat-topped mound (the motte) upon which a timber tower may well have stood within a timber palisade, and a lower enclosure (the bailey). 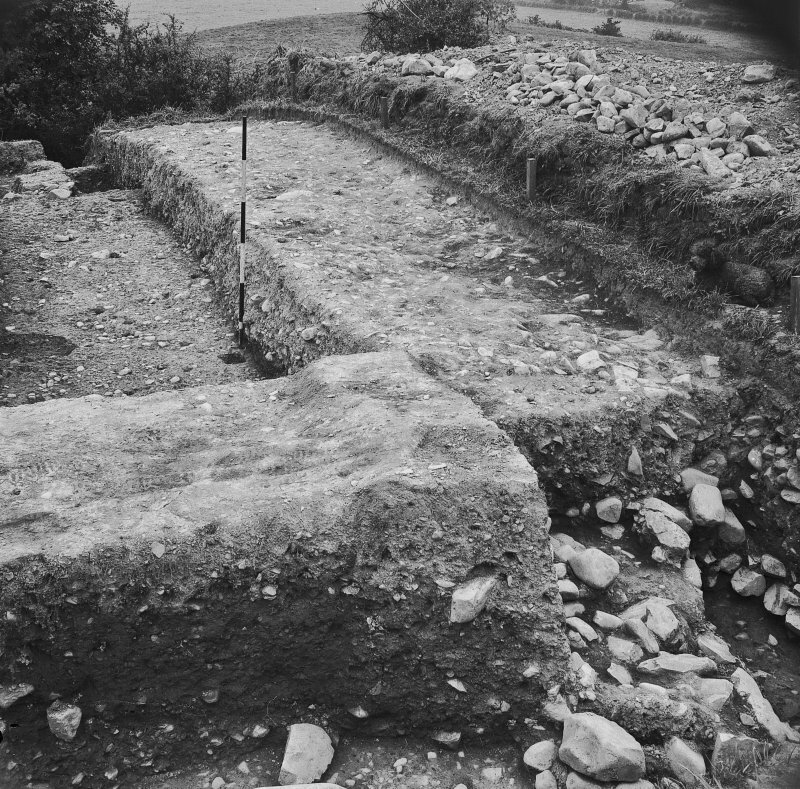 The bailey would also have been defended by a timber palisade and housed the service buildings of the castle - stables, workshops, stores and so on. 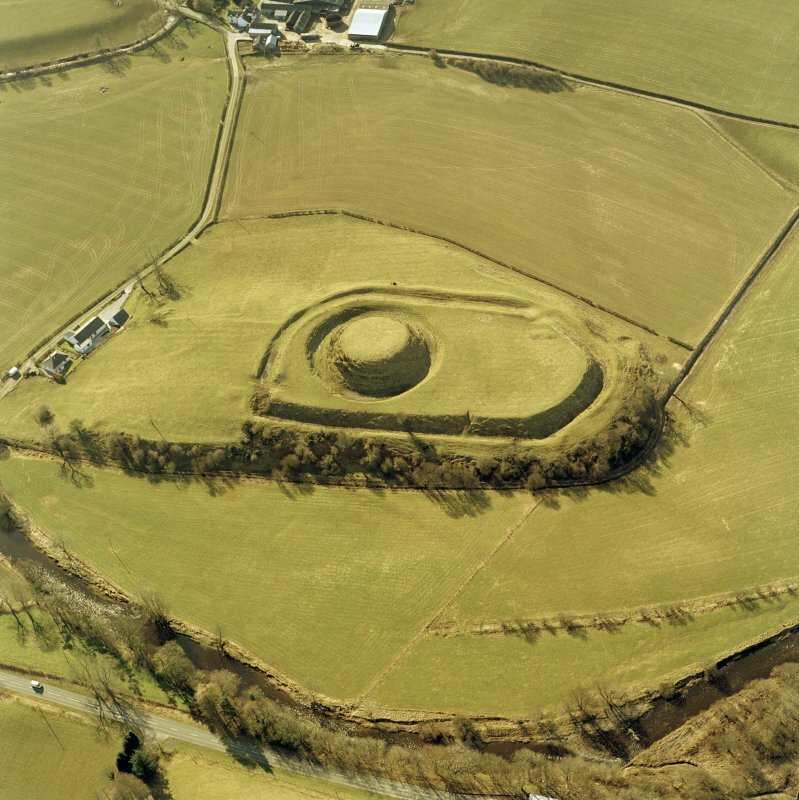 Dumfries and Galloway possesses the greatest concentration of timber castles in Scotland and the Mote of Urr stands out as the most impressive. 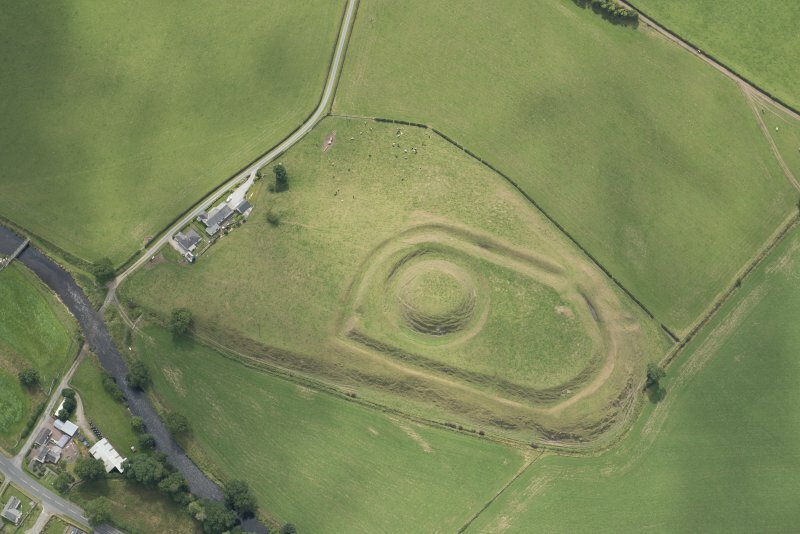 With the exception of the first castle of Lochmaben at the centre of the Bruce lordship of Annandale, most were built on a more modest scale, often utilising natural features in their construction and not necessarily following the classic motte-and-bailey plan. 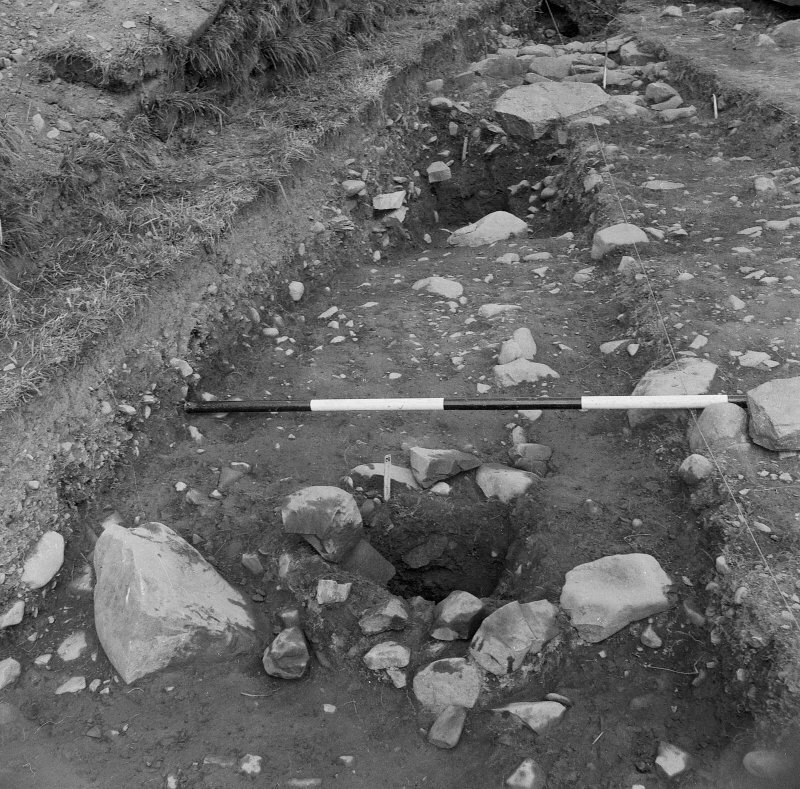 There is a long tradition in Scotland of forts and settlements with timber defences, but timber castles as private lordly residences only appeared here in the 12th century. 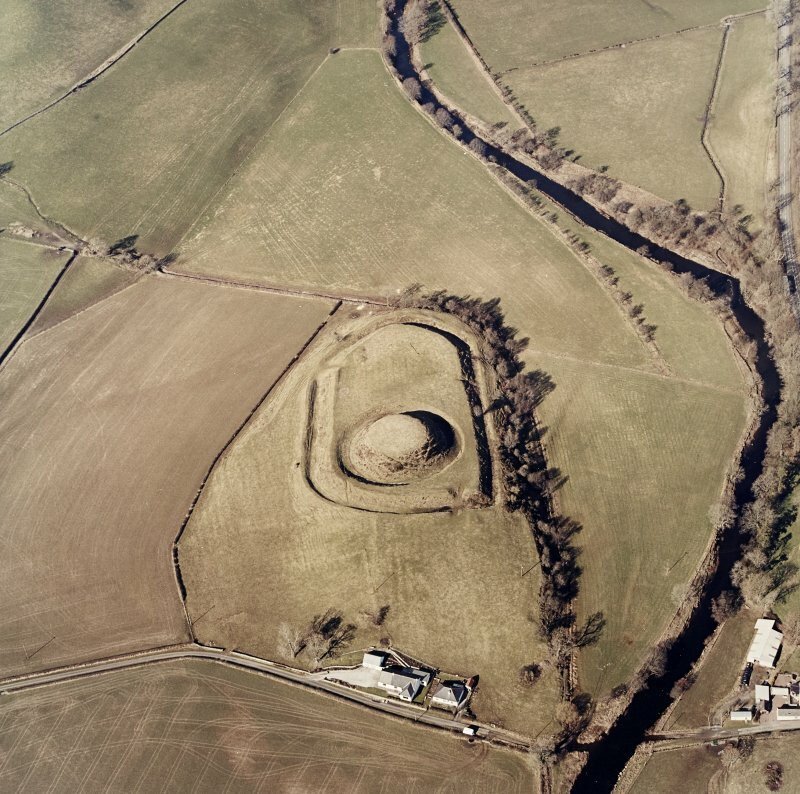 They came with Anglo-Norman lords invited to settle by the 12th and 13th century Kings of Scots seeking to feudalise the kingdom. 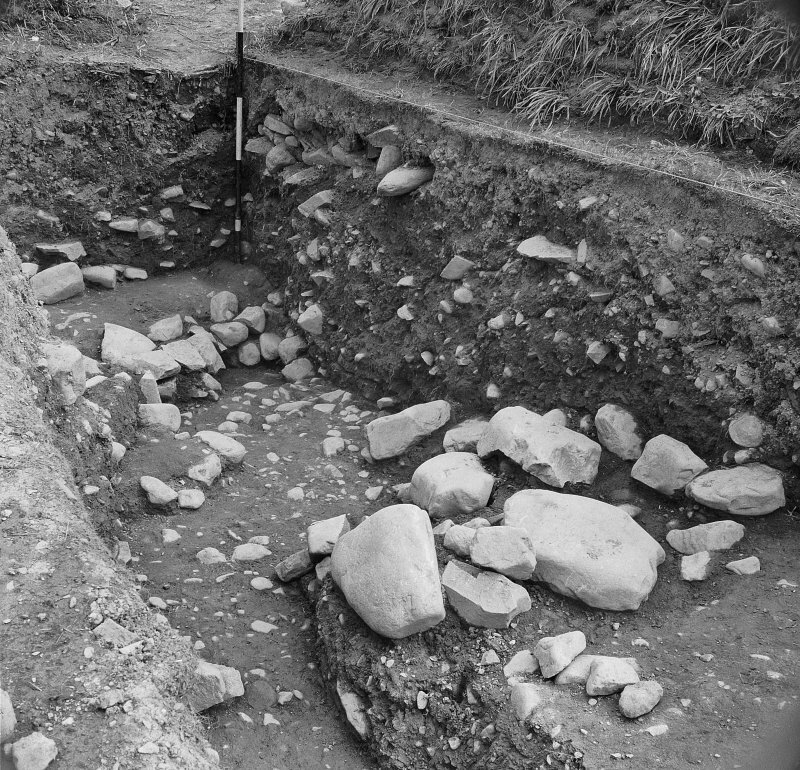 These lords were usually of Norman, French, Breton or Flemish origin, whose fathers, grandfathers or great grandfathers had settled in England following the Norman Conquest, or who sometimes came directly to Scotland from their homelands. 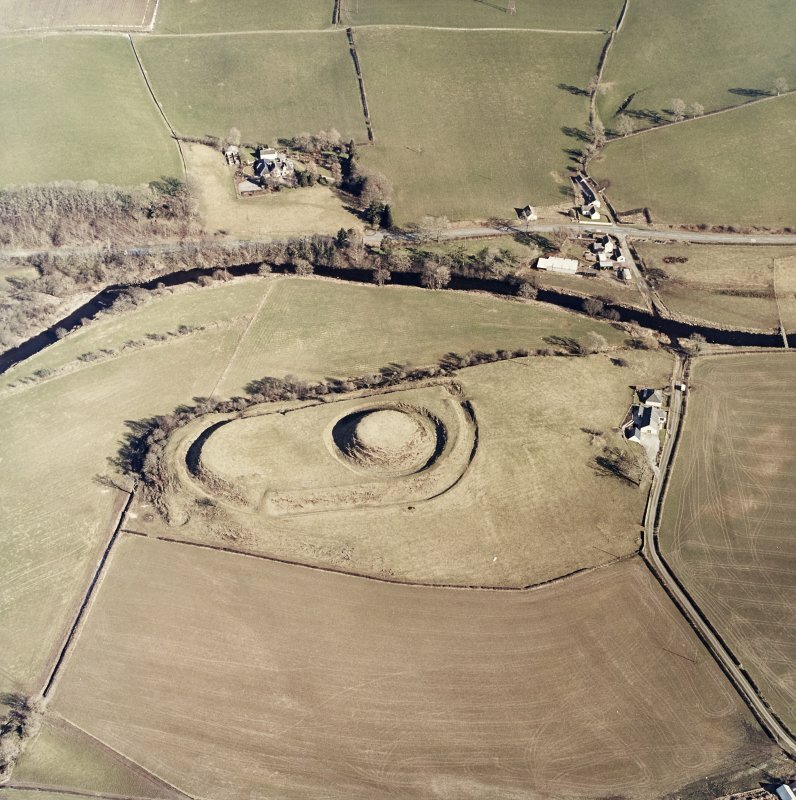 The probable builder of the Mote of Urr was Walter de Berkley, royal chamberlain to William I ‘the Lion.’ His importance was reflected in the large estate of Urr granted to him by Uhtred, the lord of eastern Galloway, and in the scale of his castle. 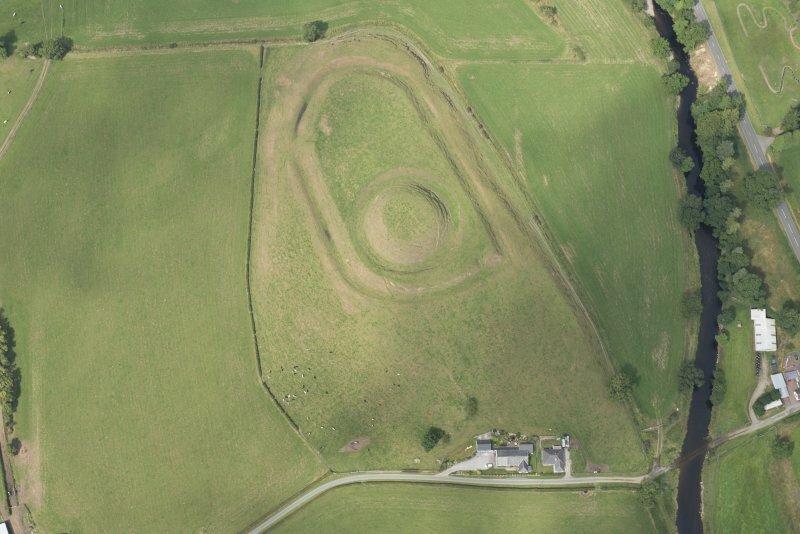 Although a defensible site and probably built to impress, the Mote of Urr was also the centre from which the accompanying estate was administered, where rents in kind were collected and stored and from which law was dispensed. 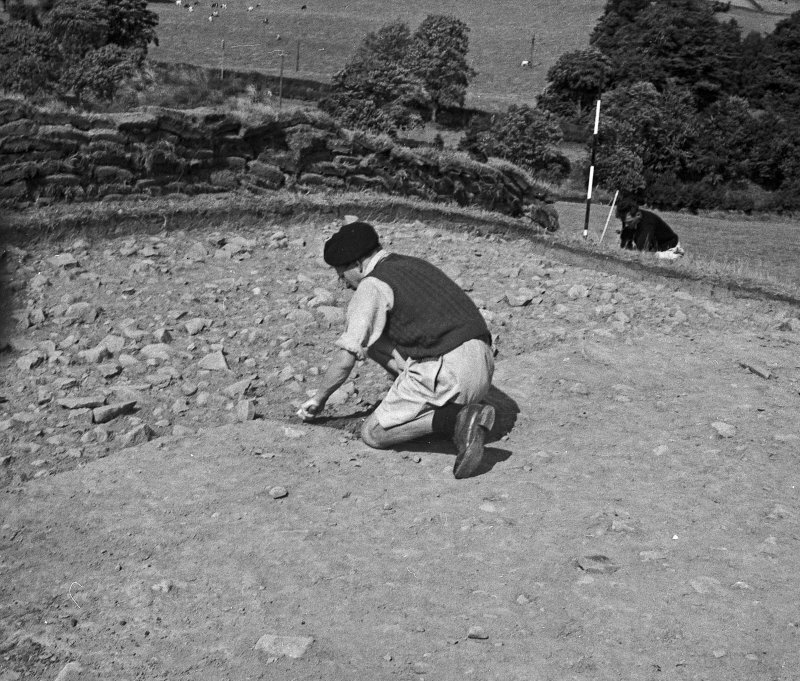 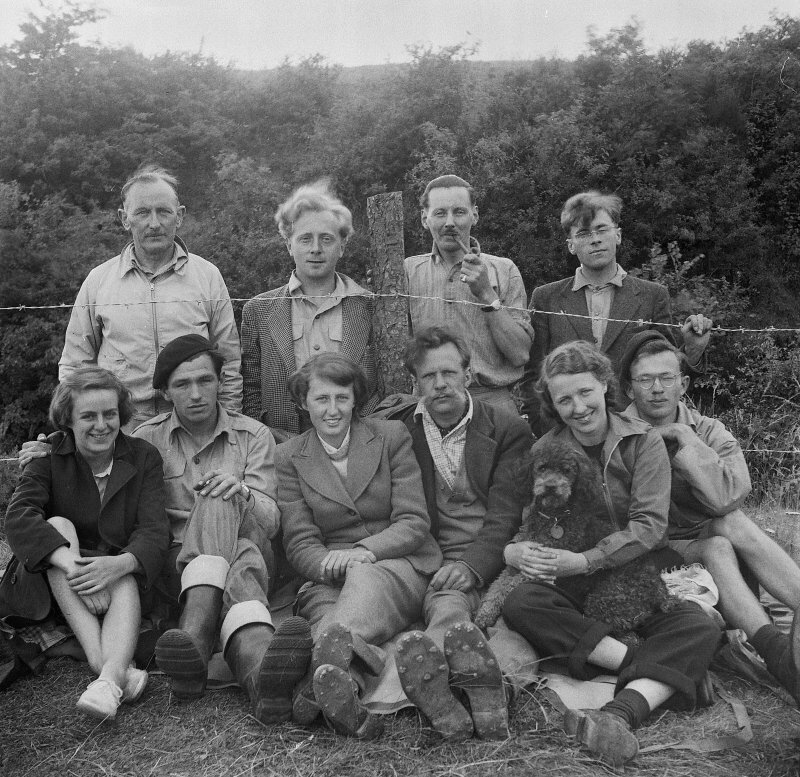 Excavations led by the late Brian Hope-Taylor were carried out on the summit of the motte in 1951 and 1953. 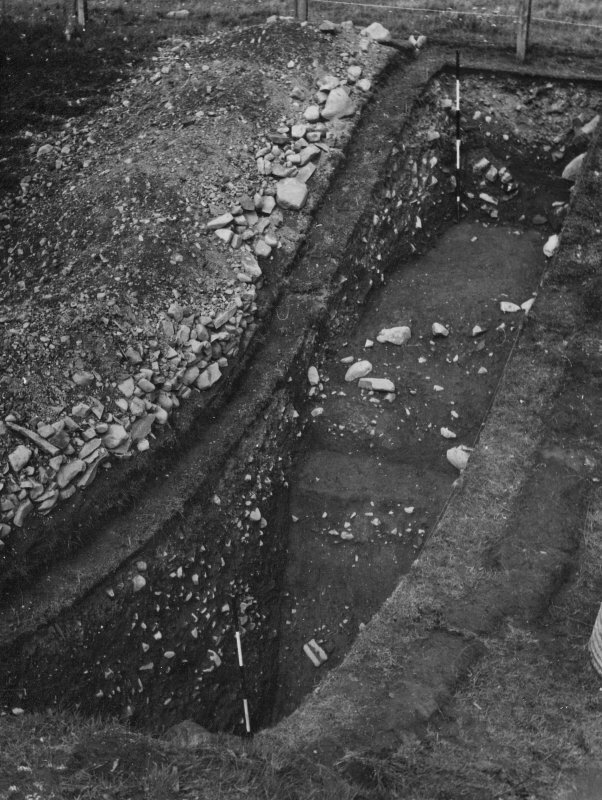 He had previously undertaken pioneering work on the motte at Abinger in Surrey, stripping the entire summit and revealing the post-holes of both palisade and central tower. 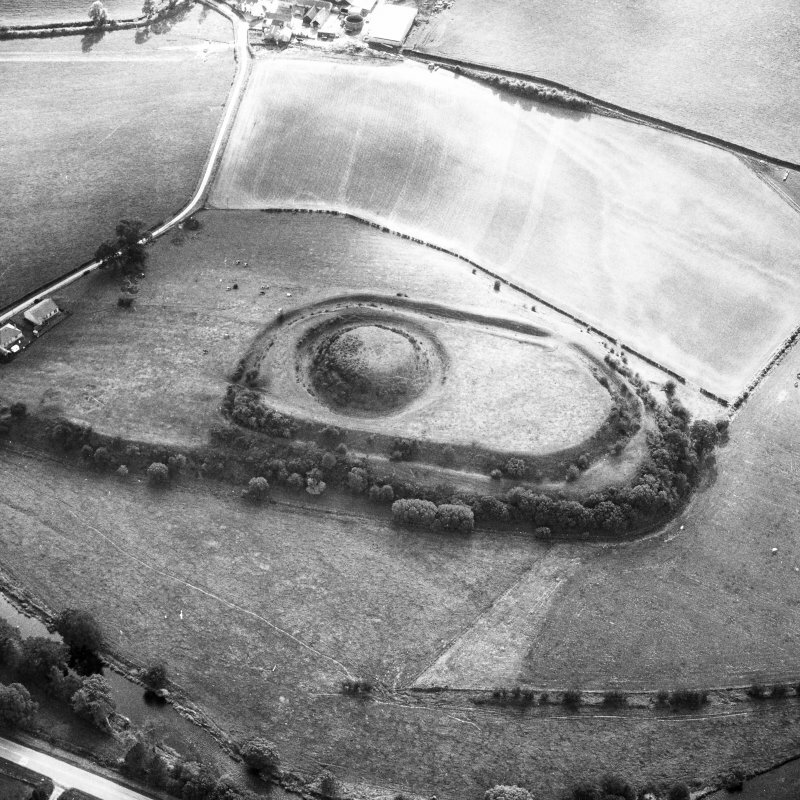 Urr was to be a continuation of this work, but it was discovered that the summit of the motte had been severely disturbed by later medieval activity and no further excavation took place after 1953. 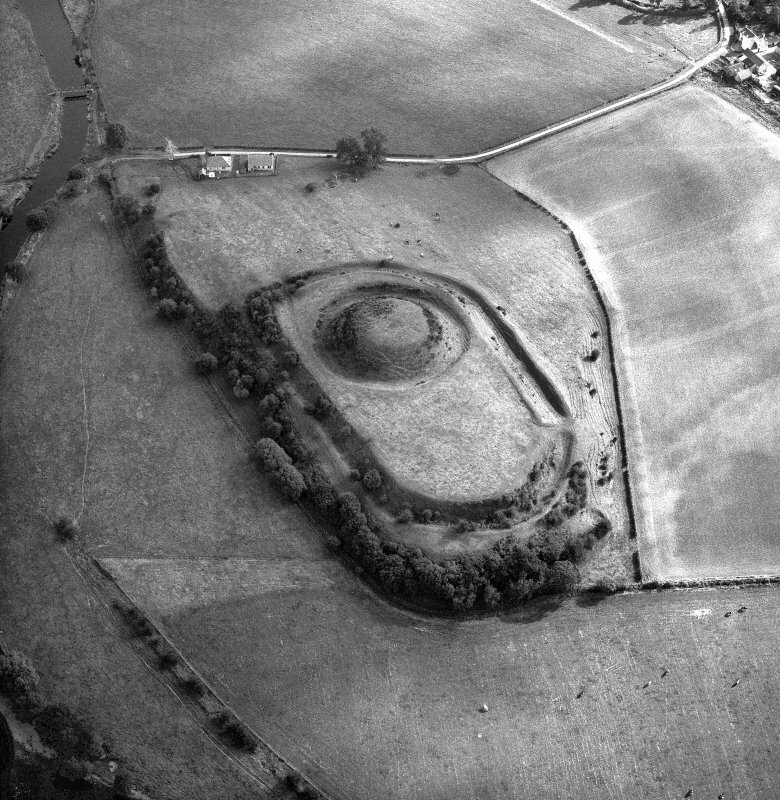 However, evidence was recovered suggesting that the structures on the motte had been burned and that rebuilding had subsequently taken place. 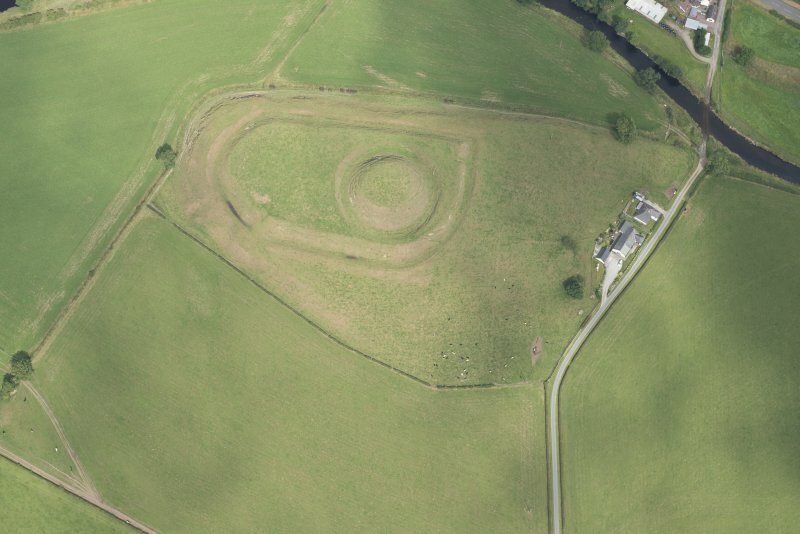 This has given rise to some speculation that it had been a victim of violent assault, perhaps in the notorious rebellion of 1174 when the chronicler Roger of Howden records that Gilbert and Uhtred ‘the leaders of the men of Galloway… expelled the king’s thanes from their territories, and slew without mercy those of English or French origin whom they found therein. 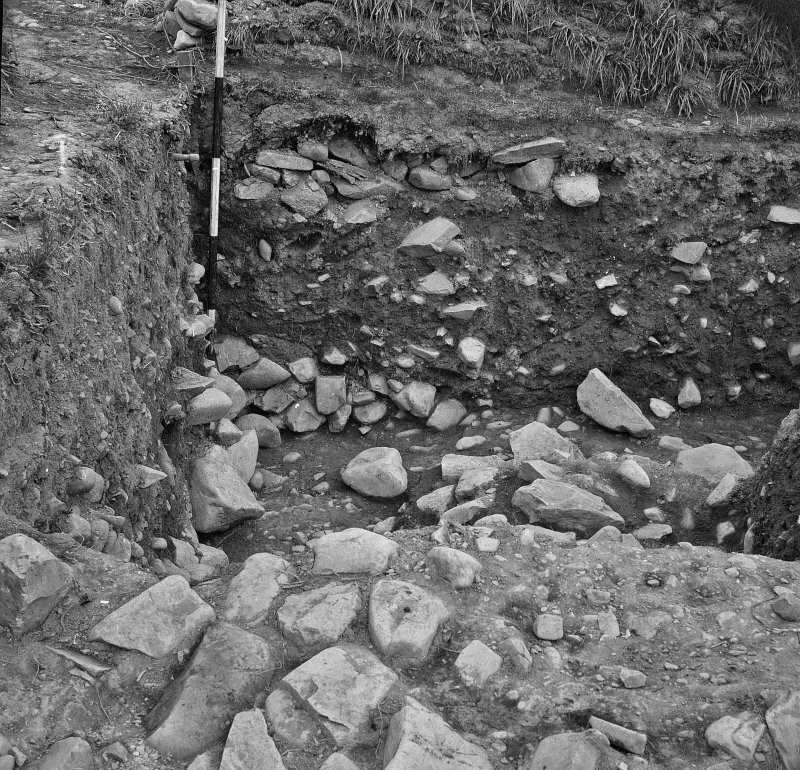 The fortresses and castles which the king of Scots had fortified in their territories they laid siege to, and capturing them, levelled them with the ground.’ An exciting interpretation which may be true, though equally it may be no more than an over enthusiastic conflation of archaeological and documentary evidence.